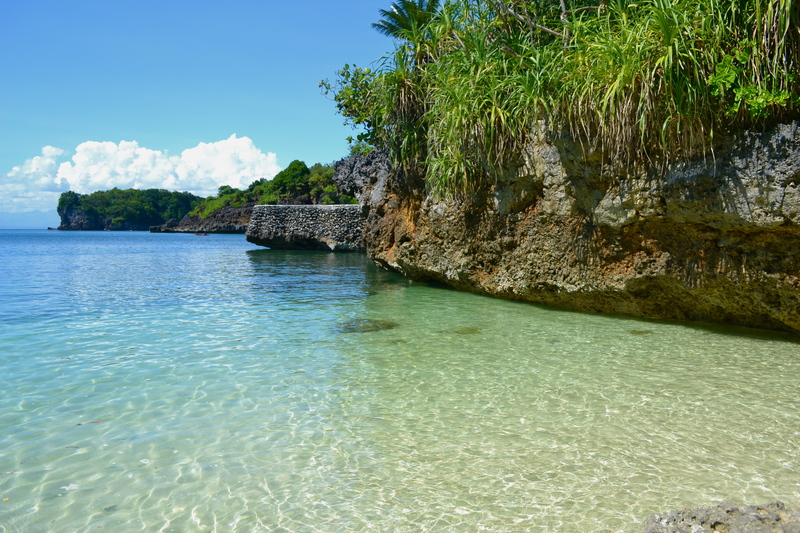 My friend and I were in Cebu and we were looking for a tourist destination near and outside Cebu that both of us have not visited yet and that would be worth our 3 days. 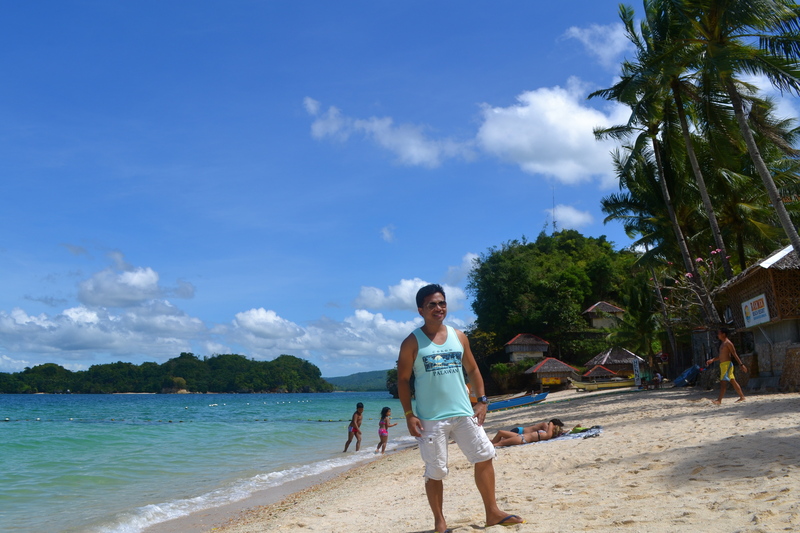 We decided to visit Guimaras Island, popularly known as the mango capital of the Philippines. 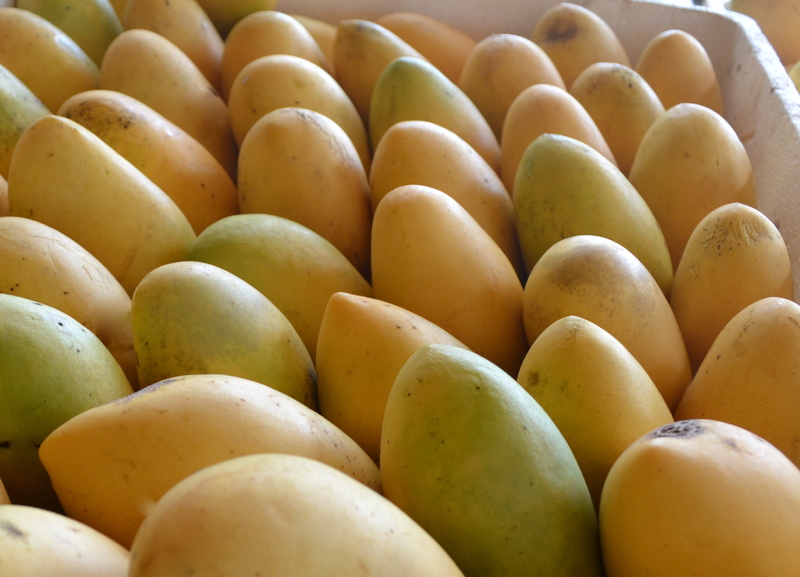 It produces the sweetest mangoes in the world that are served in the Buckingham Palace and in the White House. 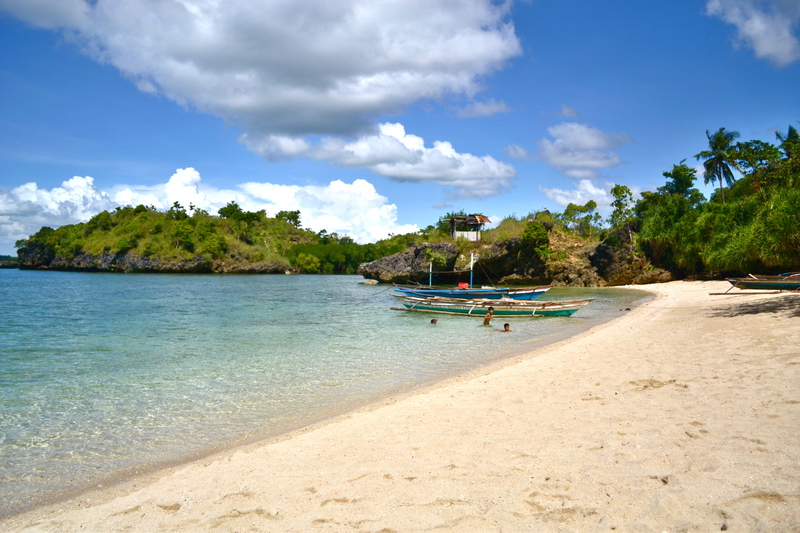 The Guimaras Mango Festival is held here during summer (usually around April). 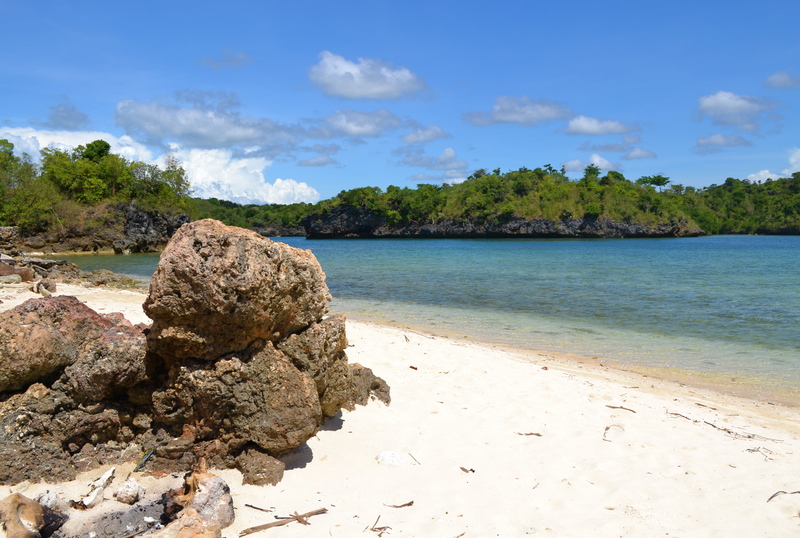 Guimaras is also known for its white sand beaches and secluded coves and caves both in the main island and in the outlying islands. 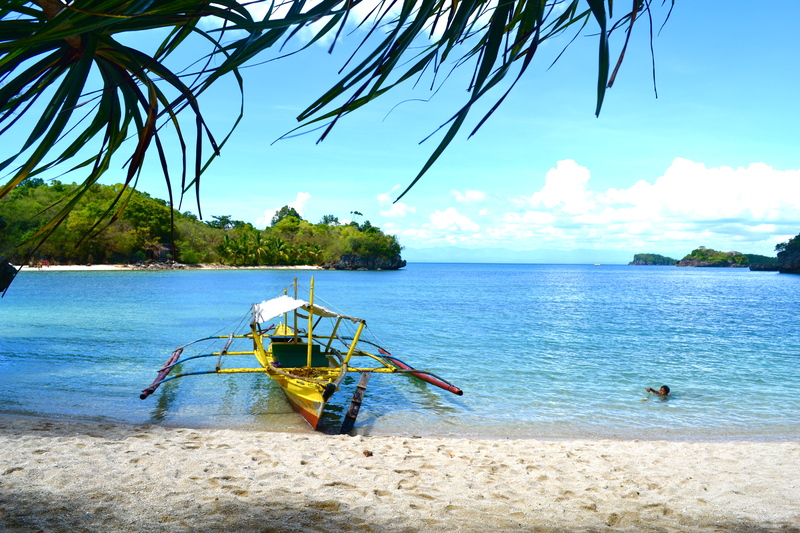 The island province of Guimaras is located in central Philippines and is just 15 minutes boat ride away from Iloilo City wharf. 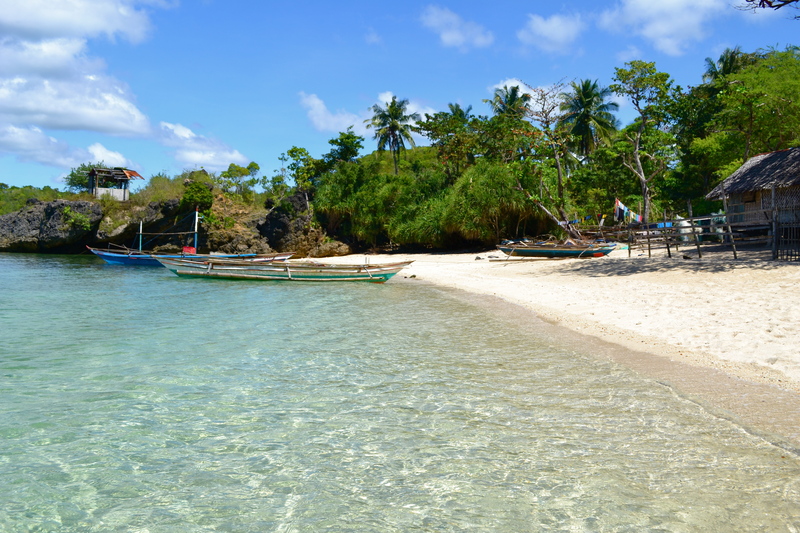 Iloilo City can be reached in less than an hour plane ride from the Philippine capital of Manila and the major cities of Cebu, Davao or Cagayan de Oro via its spanking new airport, Iloilo International Airport. 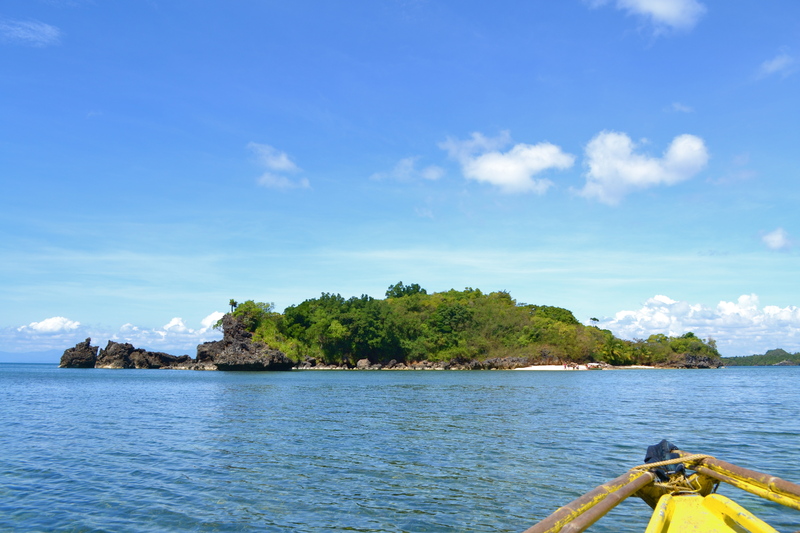 We took a short Cebu Pacific flight from Cebu’s Mactan International Airport to Iloilo City. 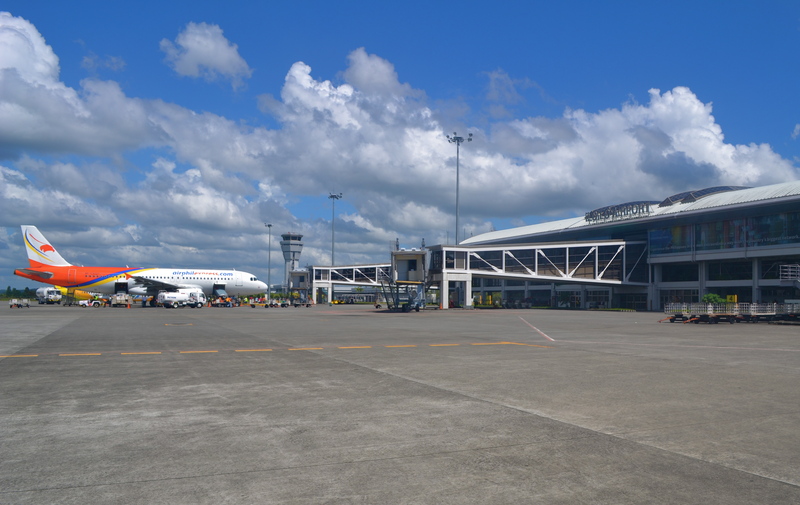 Other airlines flying to Iloilo City are Philippine Airlines, AirPhilExpress and Zest Air. 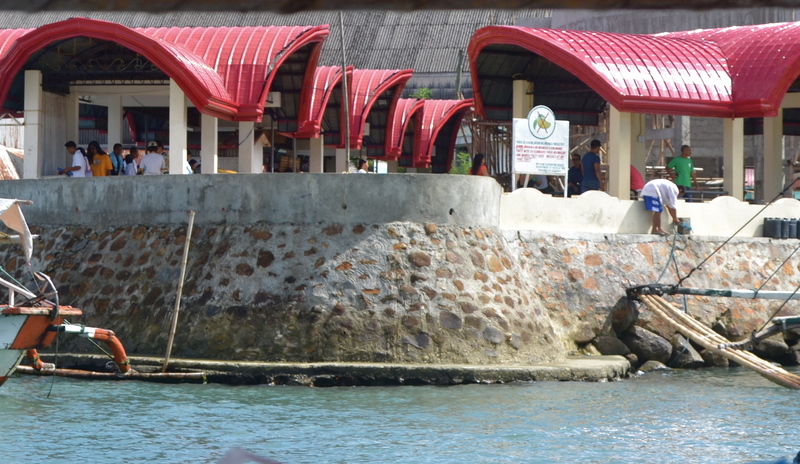 By land, Iloilo City can be reached from Kalibo for 2.5 hours or from Caticlan/Boracay for 4 hours by private car or 5-6 hours by public air-conditioned bus. 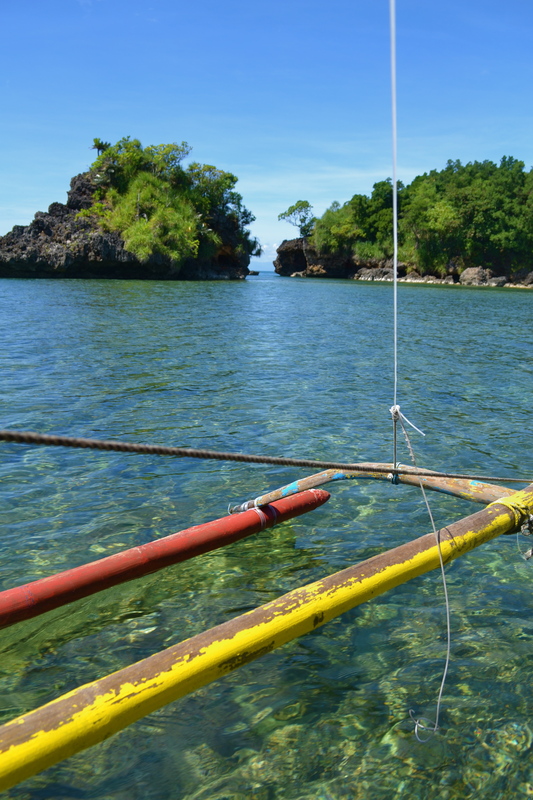 By sea, Iloilo City can be reached from Bacolod for just over an hour or from Cebu for an overnight slow boat ride. 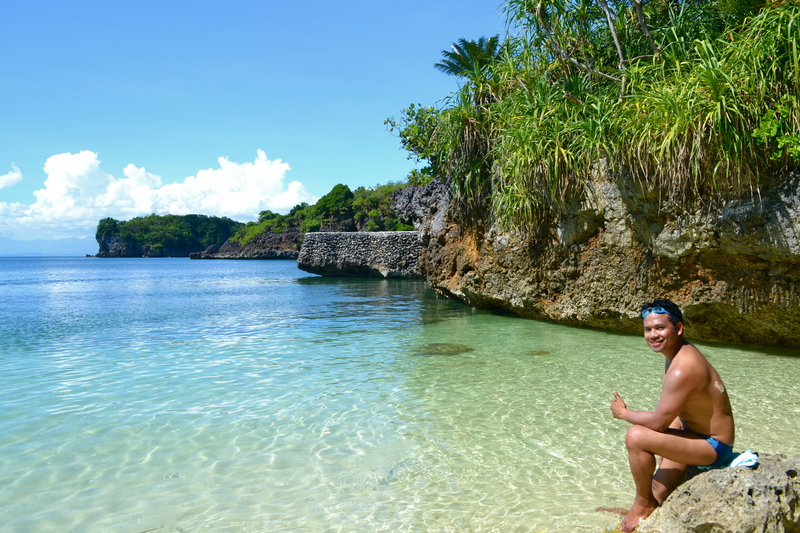 Visitors can choose to either soak in Guimaras’ beauty by camping in one of the resorts in its different islets for as many days as they like or check-in at a hotel in Iloilo City and just explore Guimaras and its surrounding islets in just a day. 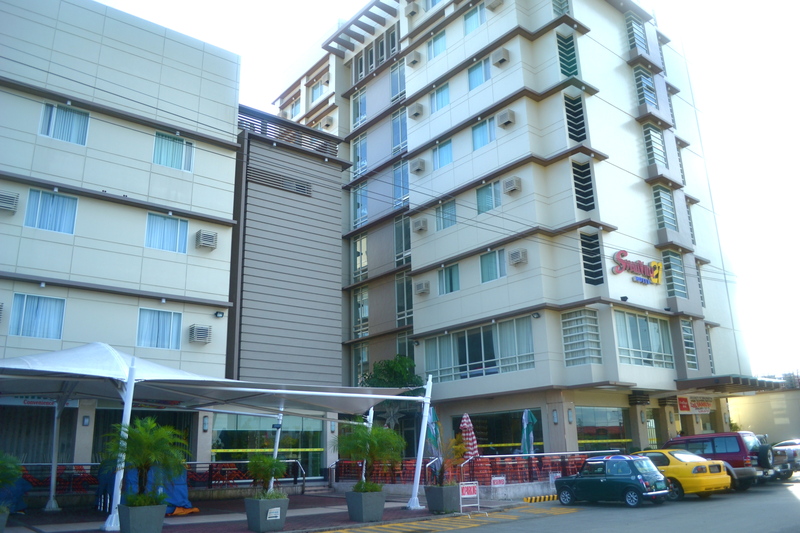 My friend and I chose the latter as we were only in Iloilo for 3 days and 2 nights; we made Smallville21 Hotel as our base. 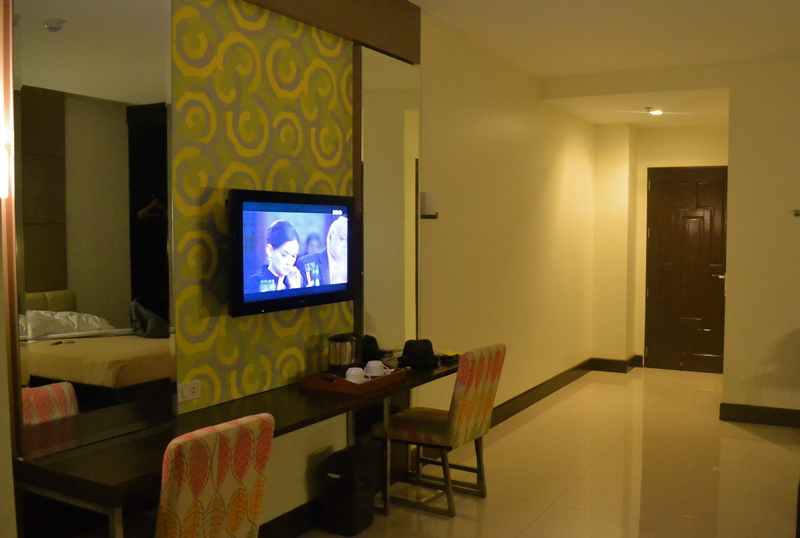 We took hotel brochures in the airport and we decided to take a room at Smallville 21 Hotel. 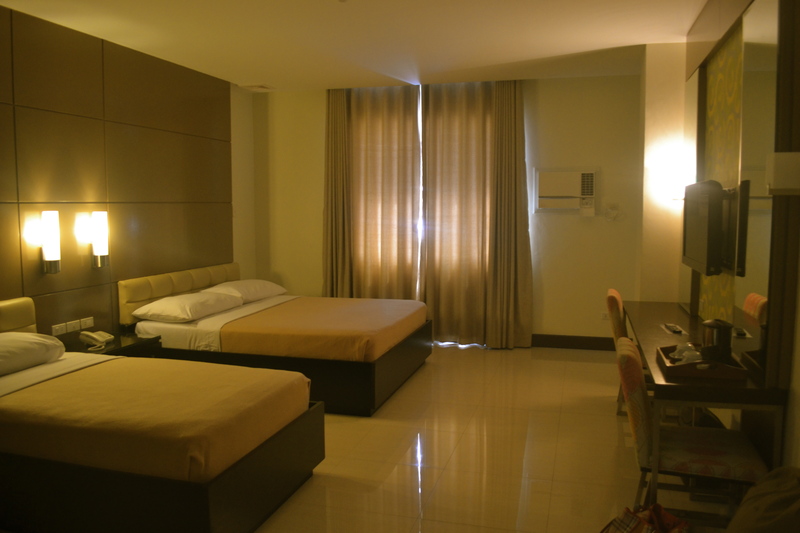 One of the newer hotels in the area, it is in the heart of the city’s hottest nightlife area and steps away from the new Ayala Technohub. At a very reasonable rate, my friend and I were absolutely happy with our choice. 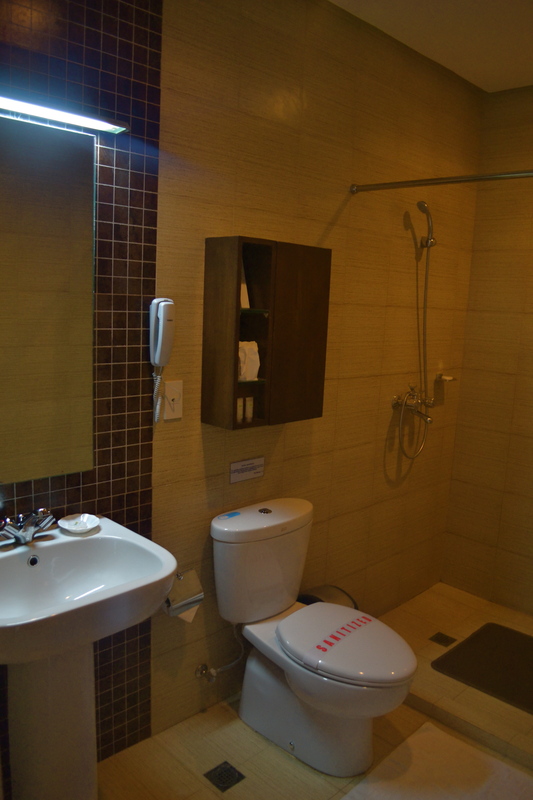 The room was spacious, cozy and contemporary. 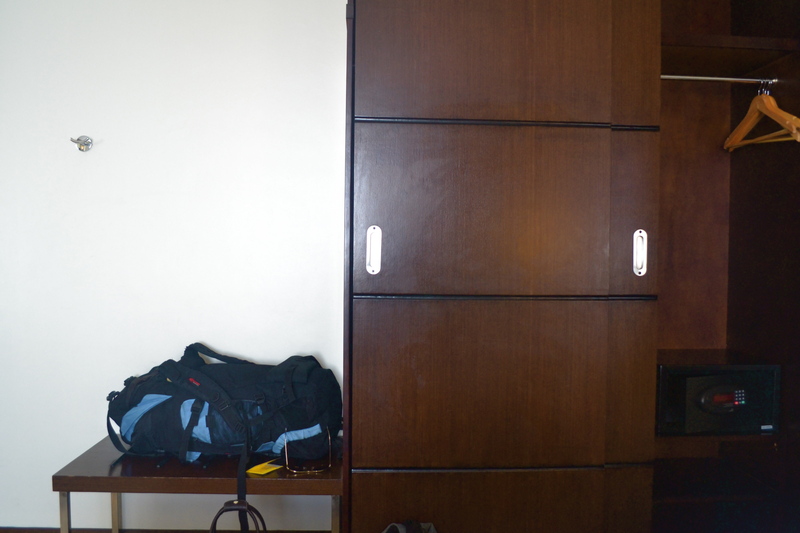 I love the design having two vanity mirrors at either side of the long, wall-mounted side table. 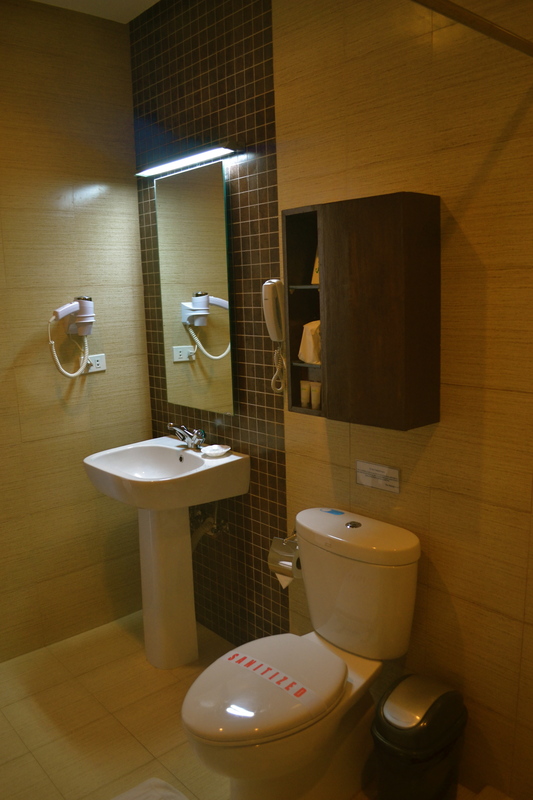 Even the bathroom was very spacious. The cabinet was huge and there was a safety deposit box. 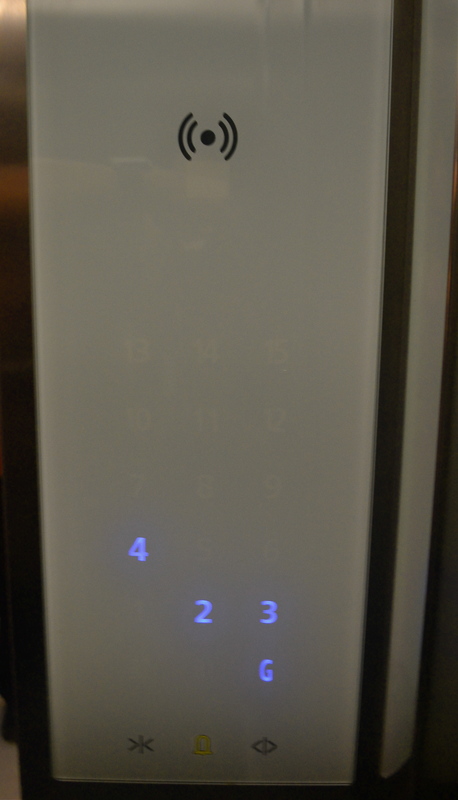 To top everything else, the elevator was one of the first I have seen in a non-5-star hotel that’s touch-controlled. We spent our first day just exploring the city and having the famous La Paz batchoy at Ted’s as it was already too late to proceed to Guimaras. 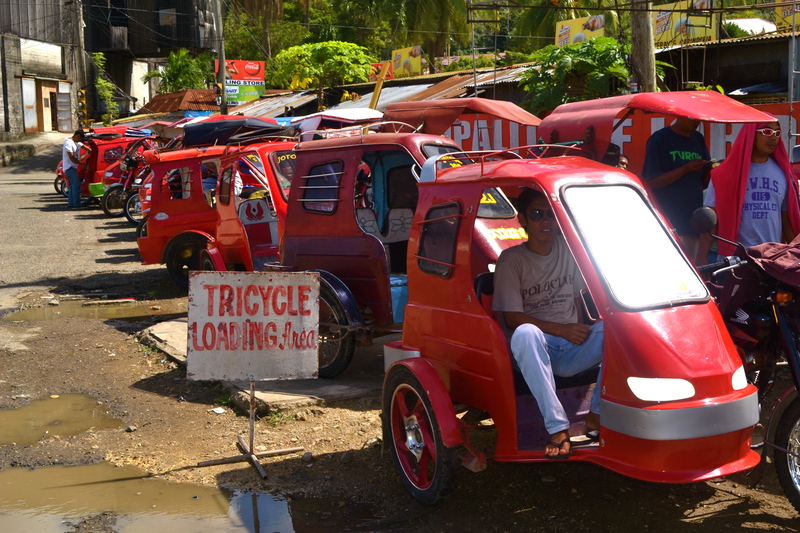 On our second day in Iloilo City, we took a taxi from our hotel to Iloilo City port. 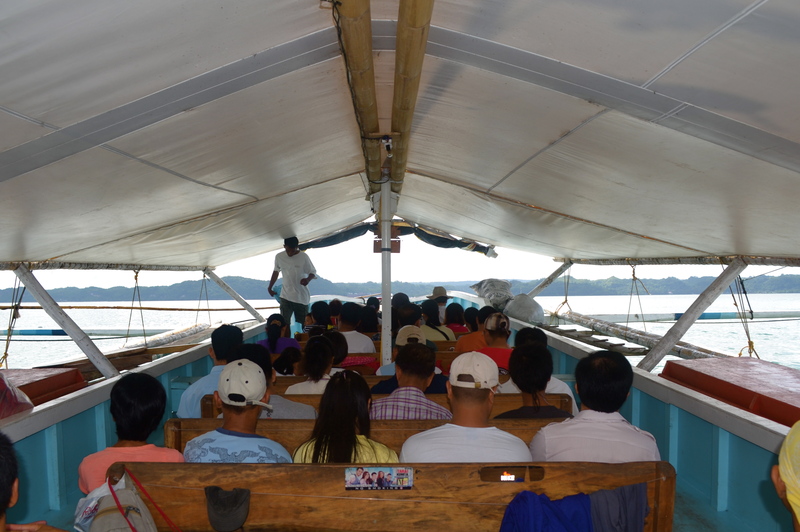 We then took the 15-min, 14-peso boat ride on one of the public boats shuttling to and from Guimaras every 15 minutes. 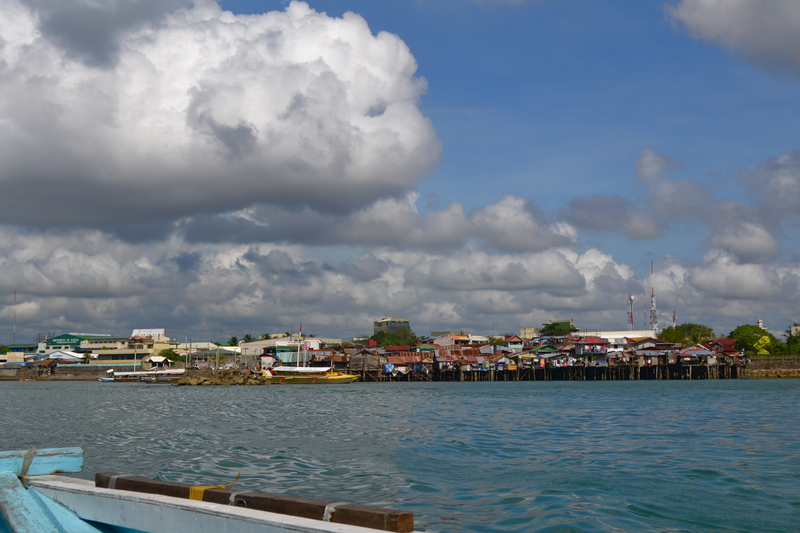 Looking back from the boat, the Iloilo City port appeared as colorful as the shanties built adjacent to it. 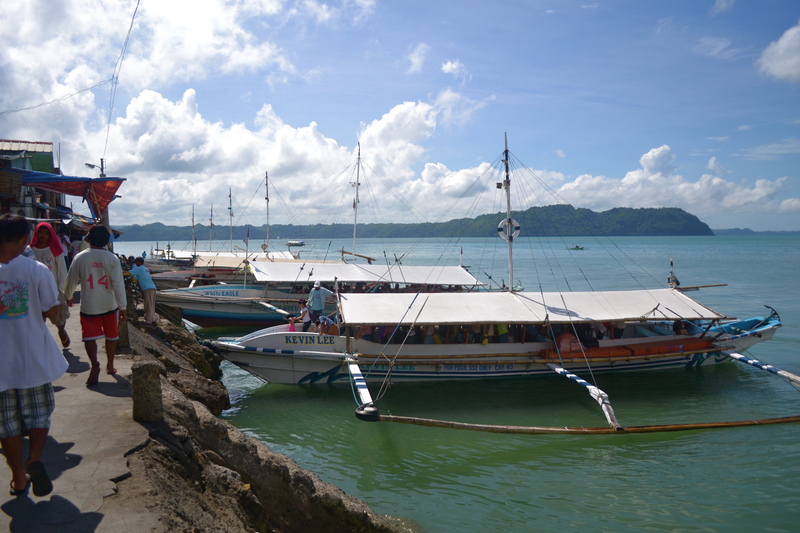 We reached Jordan wharf in Guimaras island which would serve as our entry to the island province. 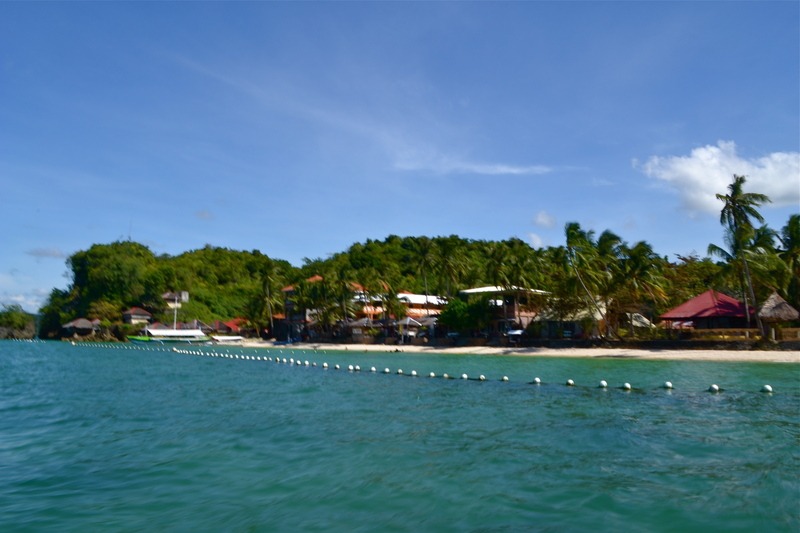 At the Jordan pier, we had to take take a 35-min tricycle ride to Alubihod where Alubihod beach and a number of resorts are located. We stopped only once to gas up. 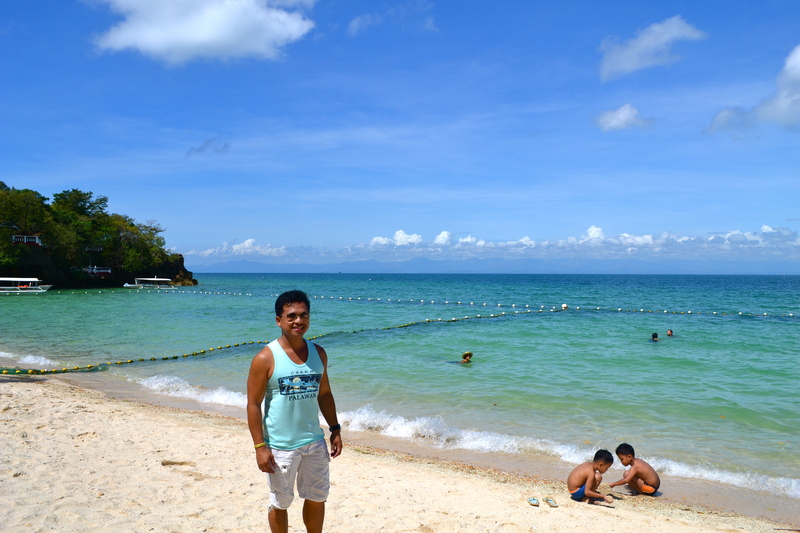 We reached Alubihod and we paid a 25-peso entrance fee to pass through Raymen Beach Resort directly to the beach. 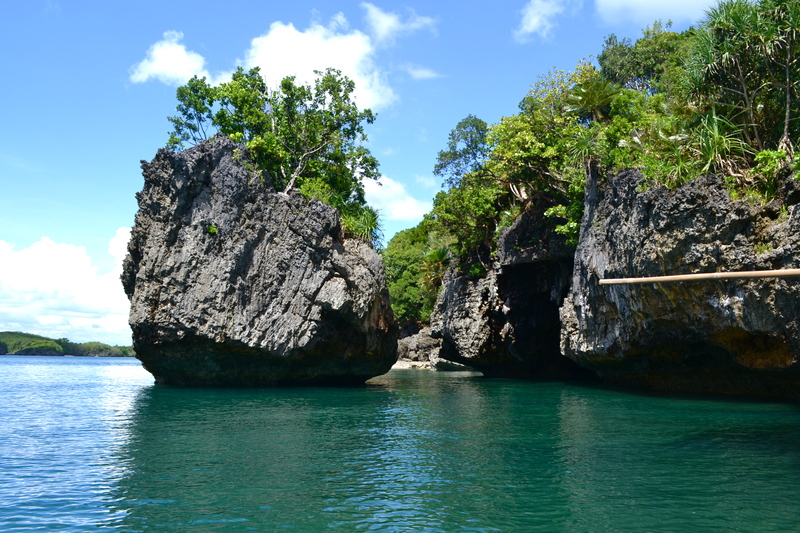 Honestly, I was disappointed thinking that this was just about the Guimaras hype, not realizing I was in for a big surprise. 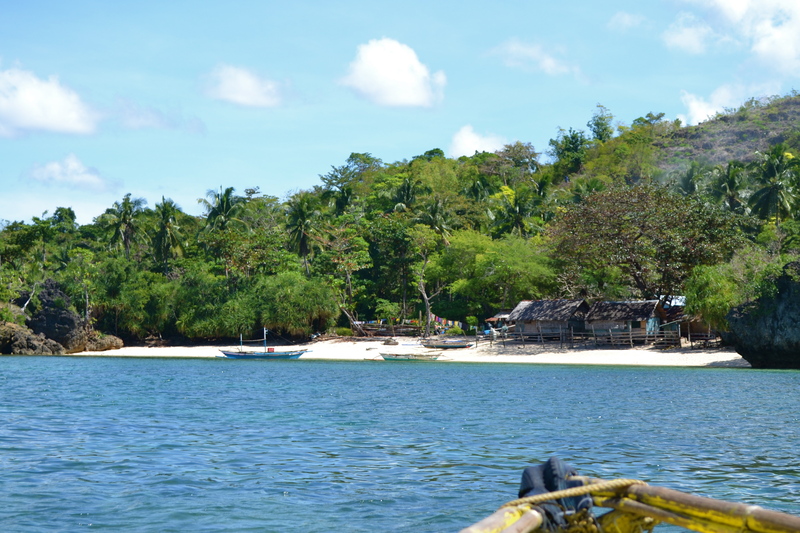 We stayed at Alubihod Beach for a while until we decided to take the island hopping tour. 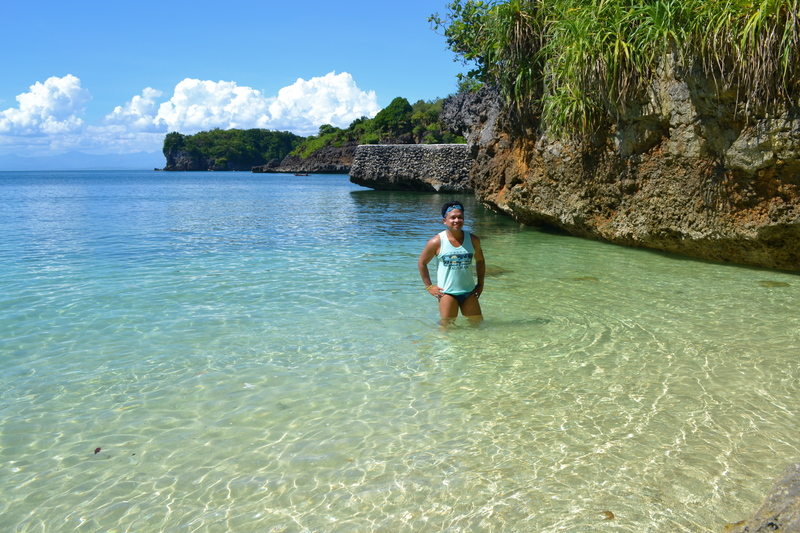 I was hesitant at first because I saw no enticing promo pictures in the tour kiosk but since we had nothing to do except to laze on Alubihod Beach, we decided to go for the tour. 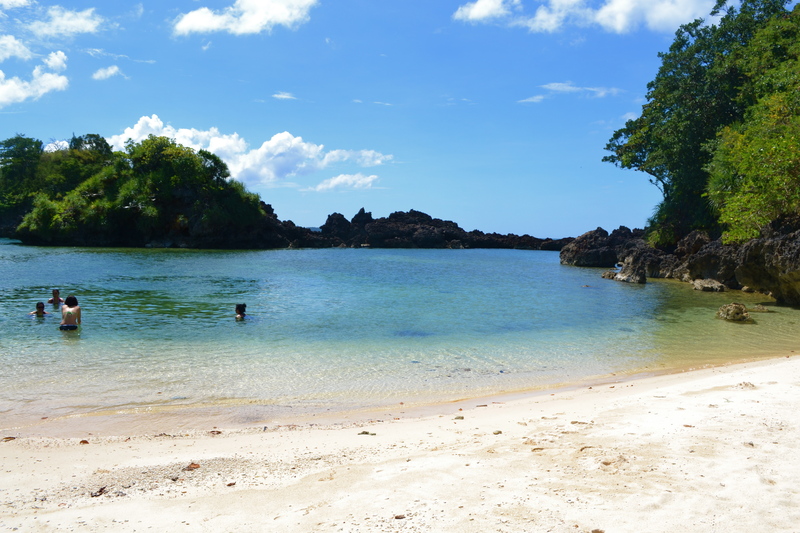 Alubihod Beach was our jumping off point of the 2-hour island tour that took us to Fairy Castle, Ave Maria Island, Turtle Island and Natago Island. 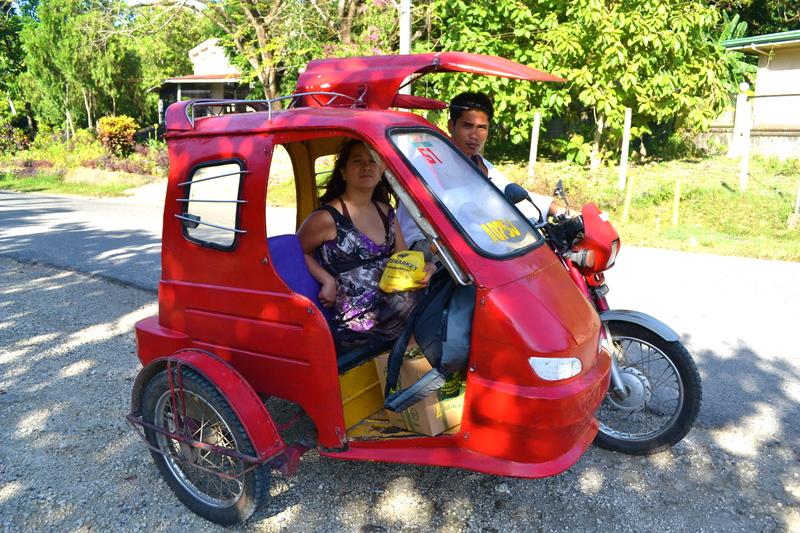 We were charged 400 pesos for the first hour of the island tour and 150 pesos for each additional hour thereafter. 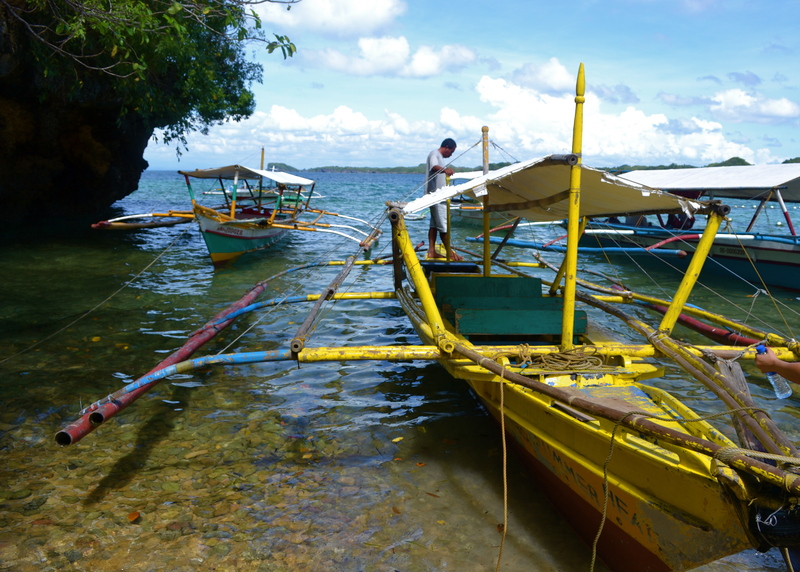 At one end of the beach are boats used for island hopping and we boarded one for the island tour. The Fairy Castle was the first attraction that came into our sight. 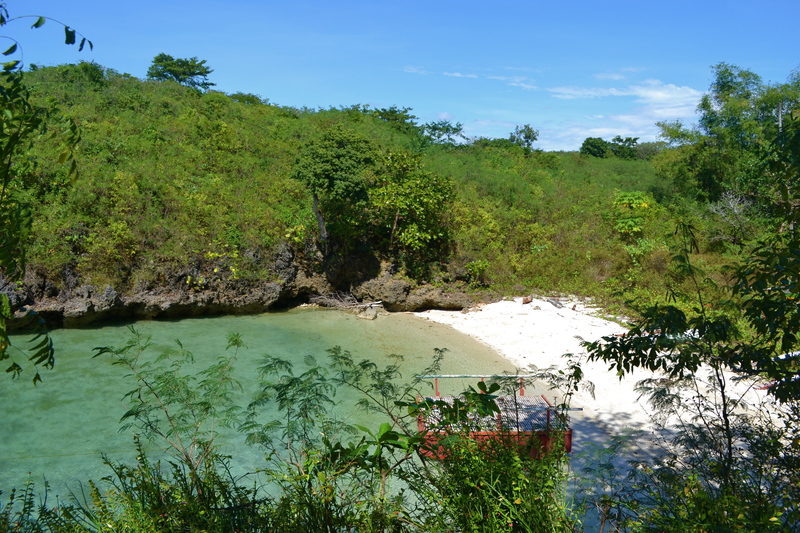 The island had been bought by a German & Filipina couple so alighting in the island was not allowed. 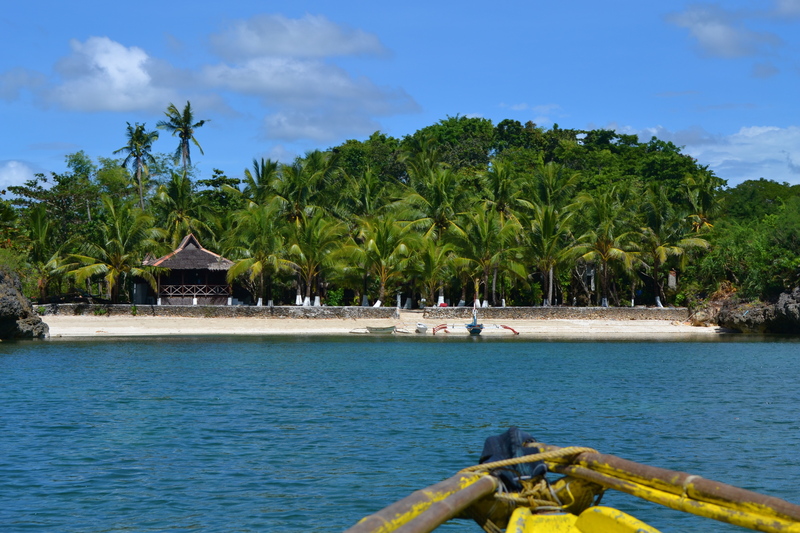 Our next destination was Ave Maria Island. 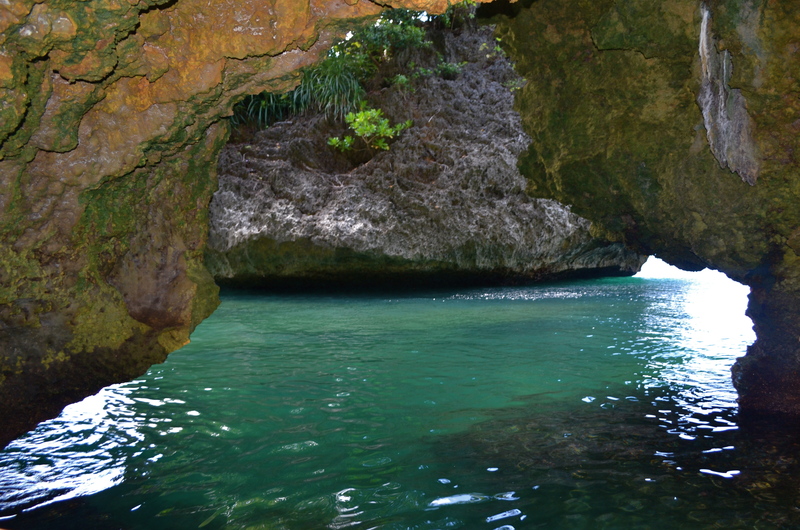 The clear waters amazed us on our way to Ave Maria Island. We found some company in the island. 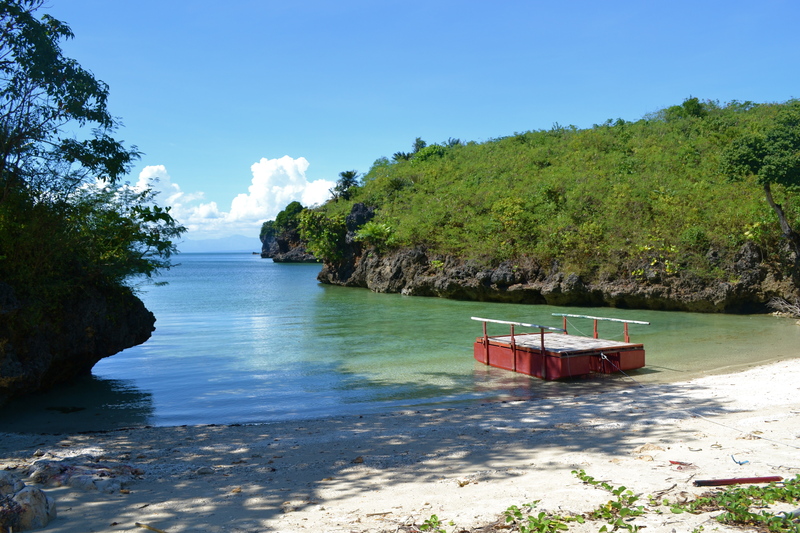 But we still took some pictures as if we were just few in the island. 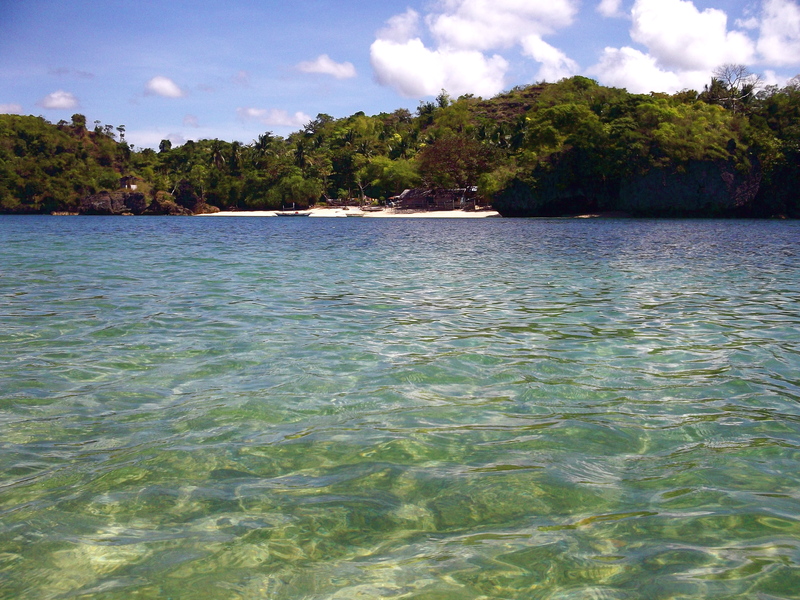 We enjoyed swimming in the crystal clear waters. 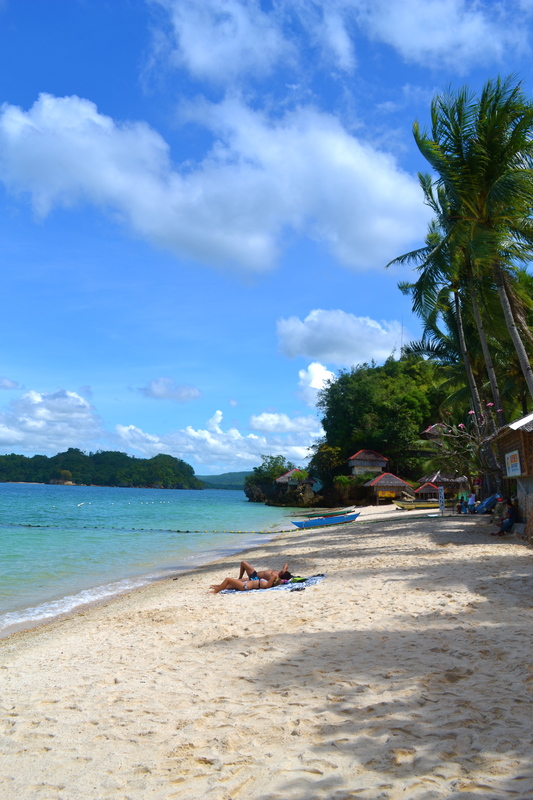 Shifting to the left side of the beach, this was the other side of the beach facing Turtle Island. 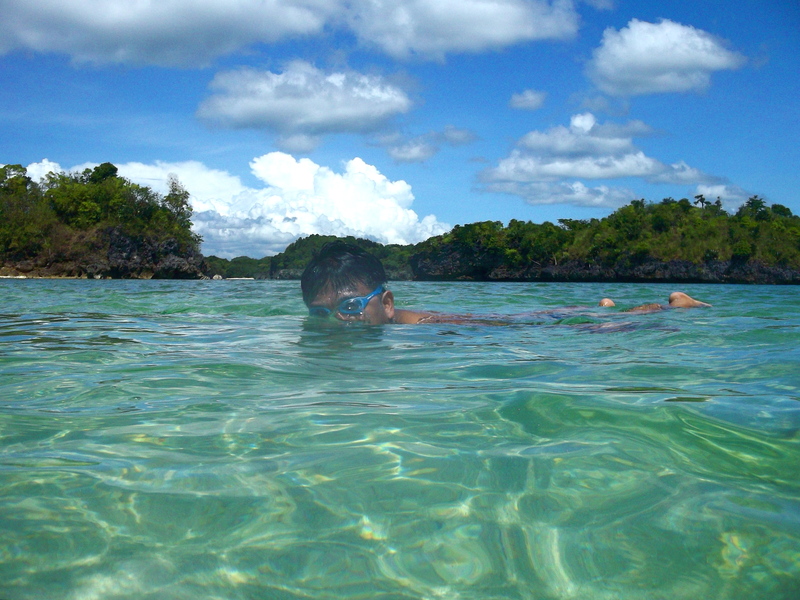 Good, I had my (first ever) waterproof camera so I was able to take shots in the water where my DSLR cannot be used. 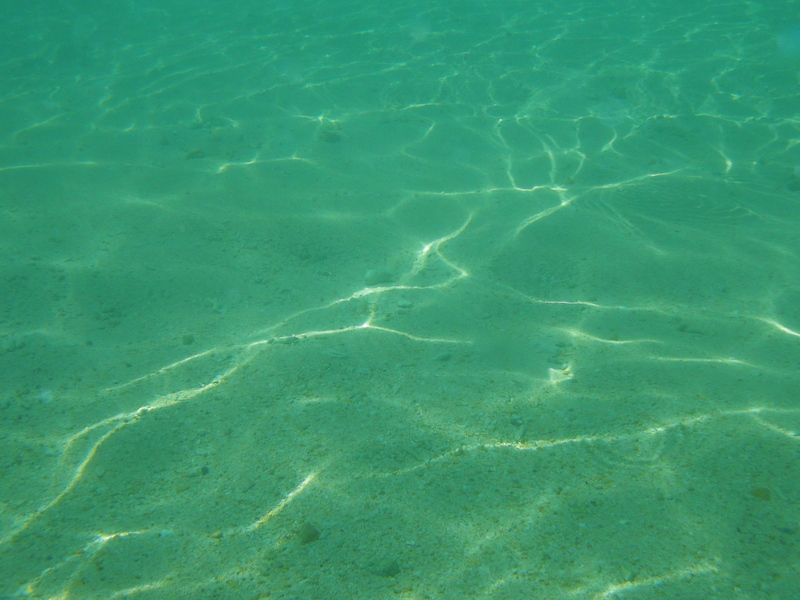 Not the best underwater camera, but it was pretty satisfactory as my gadget at the start of my foray into in-water photography. 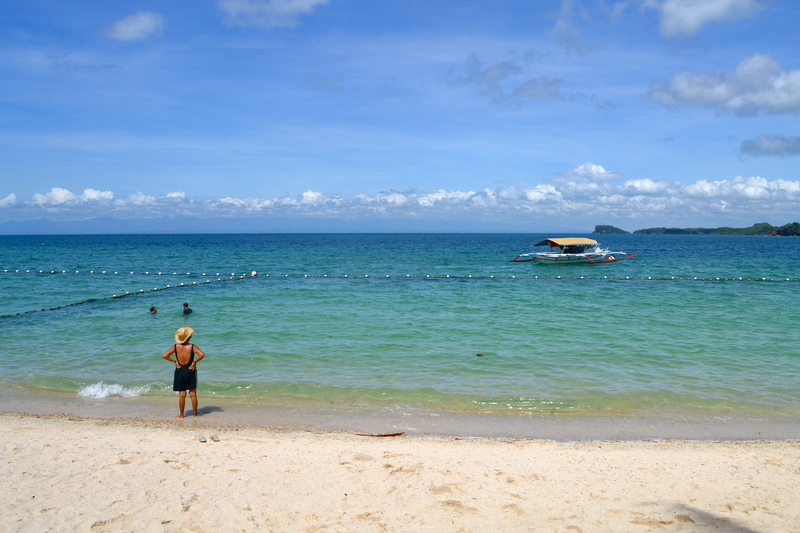 From where we were swimming in Ave Maria Island, we could see Turtle Island and one of its beaches. 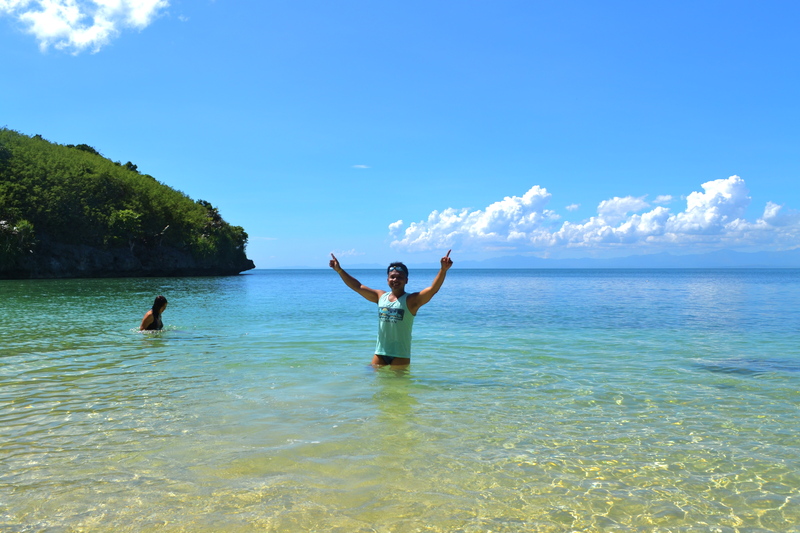 As we were leaving Ave Maria Island, our tour guide, Jomar, posed for a wacky act as we proceeded to……..
We docked at one of the beaches in Turtle Island to pay a visit to the turtle…..yes, the only one huge turtle that welcomed us. 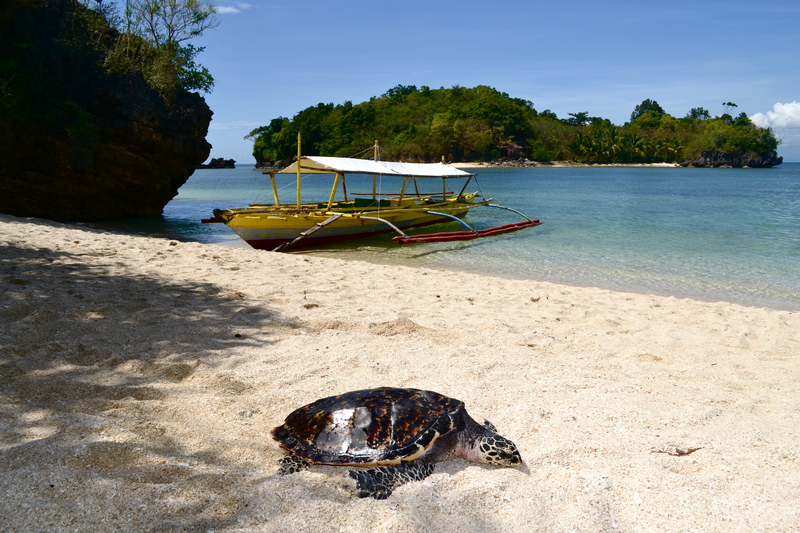 April is the month when the turtles come back to the island to lay eggs. 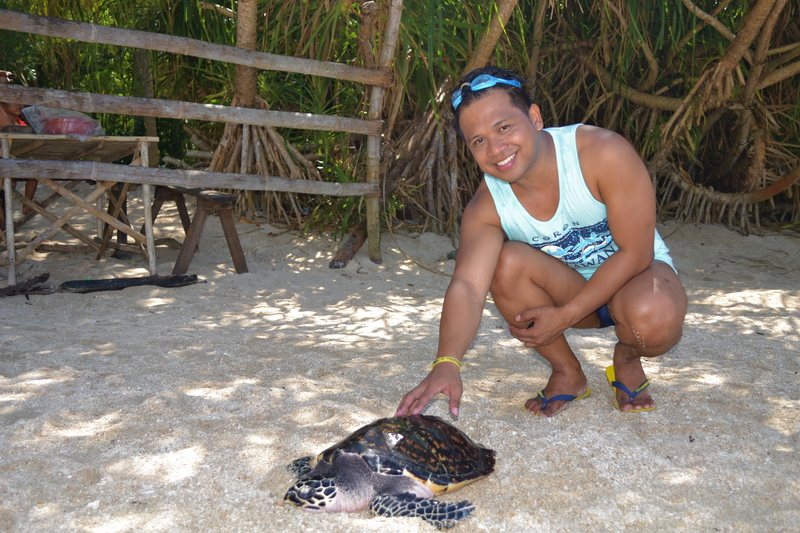 Just across Ave Maria Island, Turtle Island also has clear waters and rightfully it has the turtle(s). 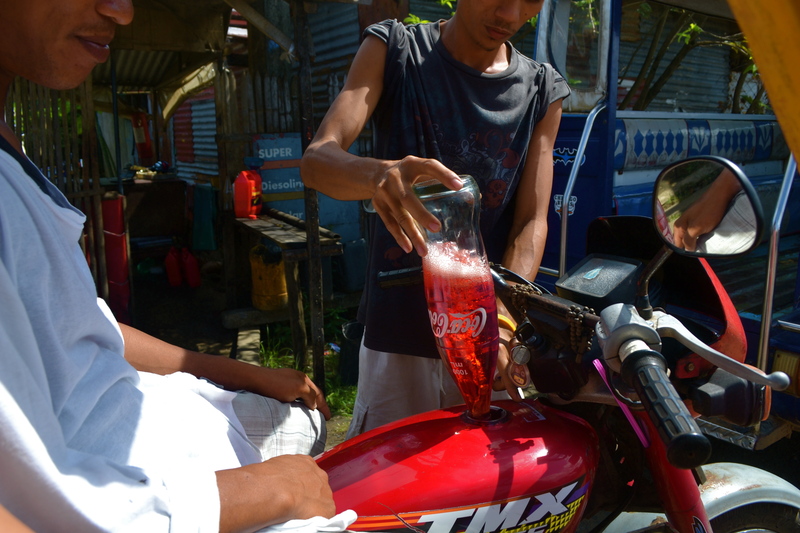 We stopped for a while in the island and had some banana fritters and soda……. 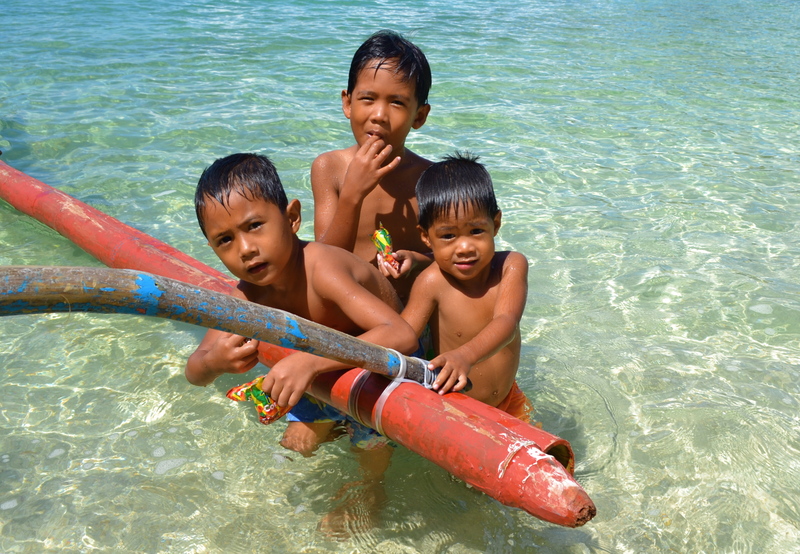 …taking photos of the island children…. …playing with the turtle and then we left. 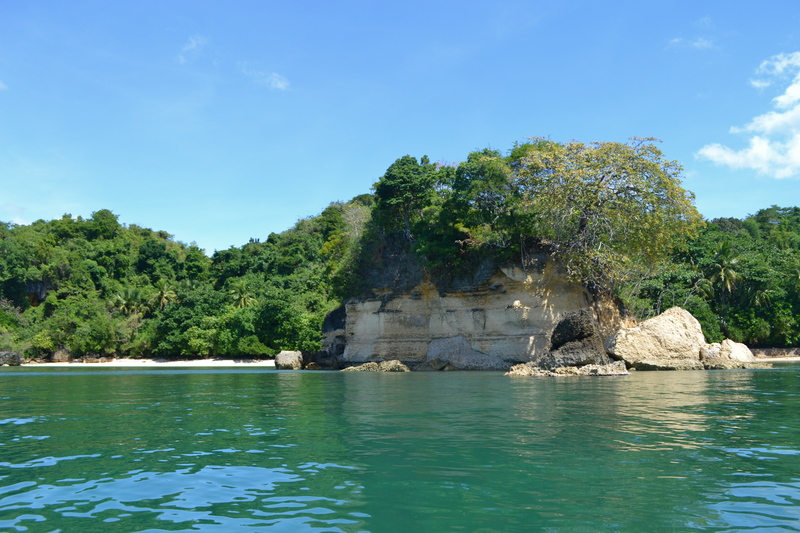 We passed by the other beaches of Turtle island….. 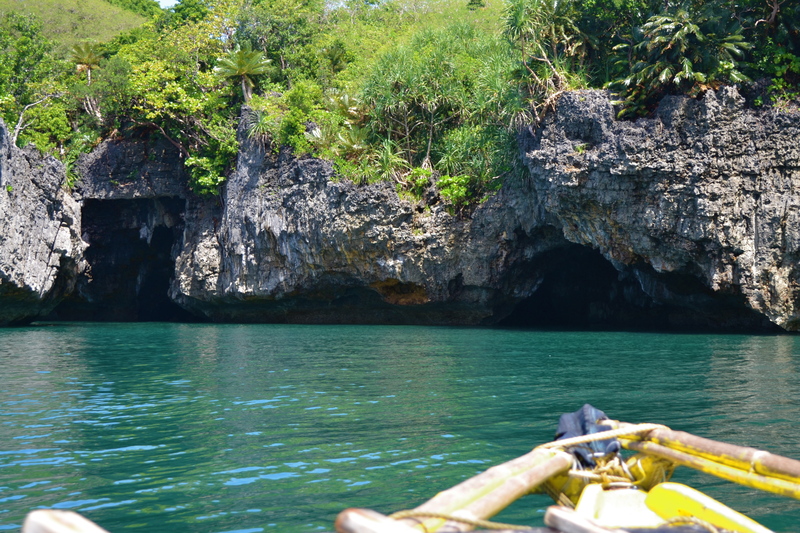 The boat engine was turned off and Jomar manually and slowly maneuvered the boat to fit into the small cave opening. 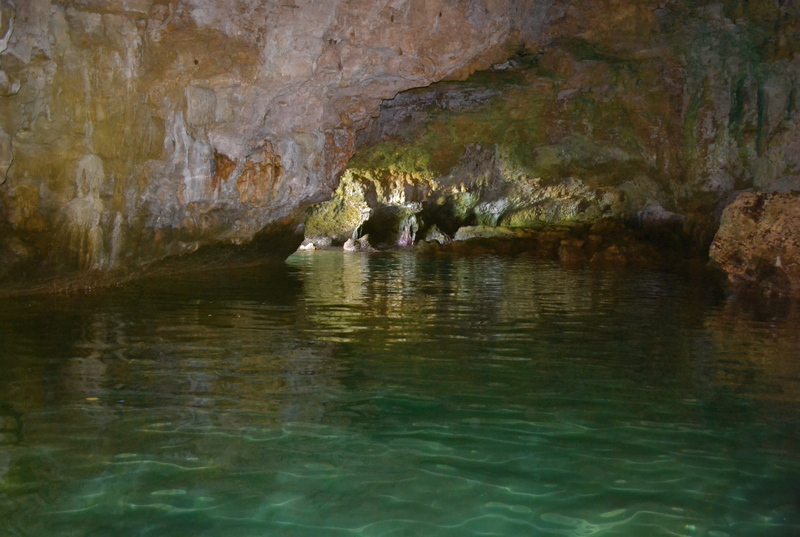 It was just a short trip inside the cave that may have looked like the Palawan Underground River. 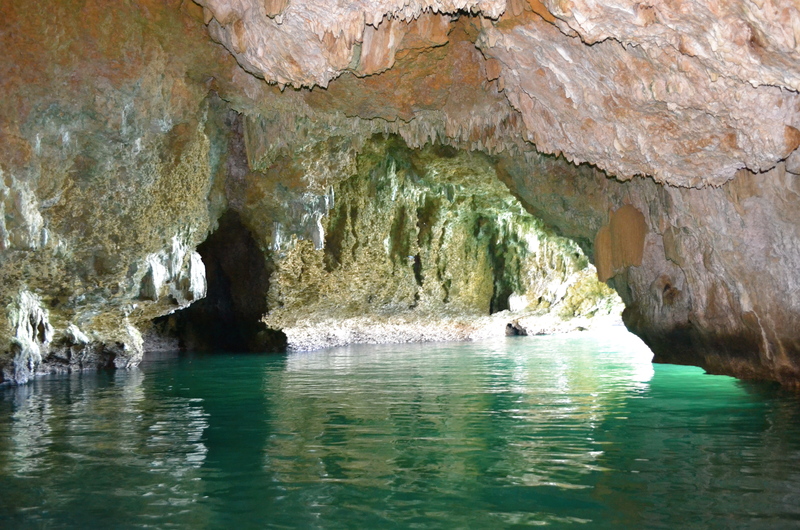 Turquoise waters and colorful ceiling of the limestone cave amused us. And then we exited at the opening where we entered as it was not possible for the boat to exit at the other end as it was too small. 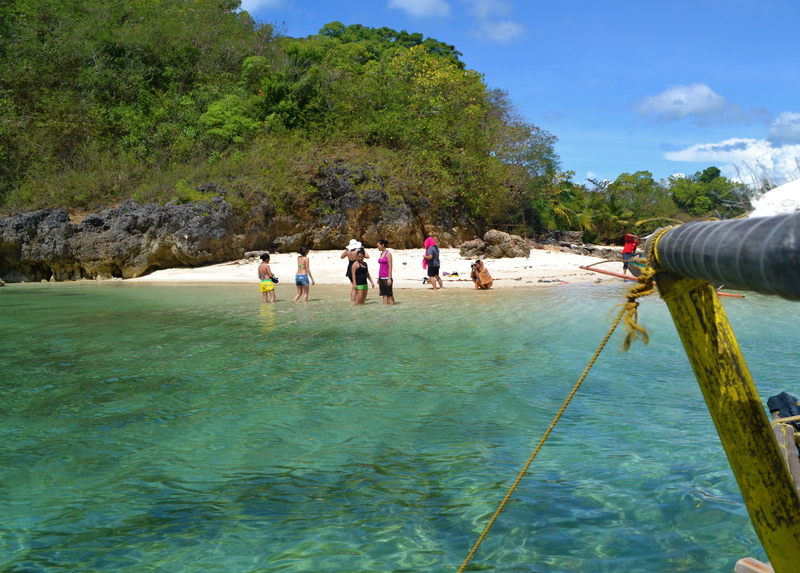 We continued our journey to our last stop: Natago Island. 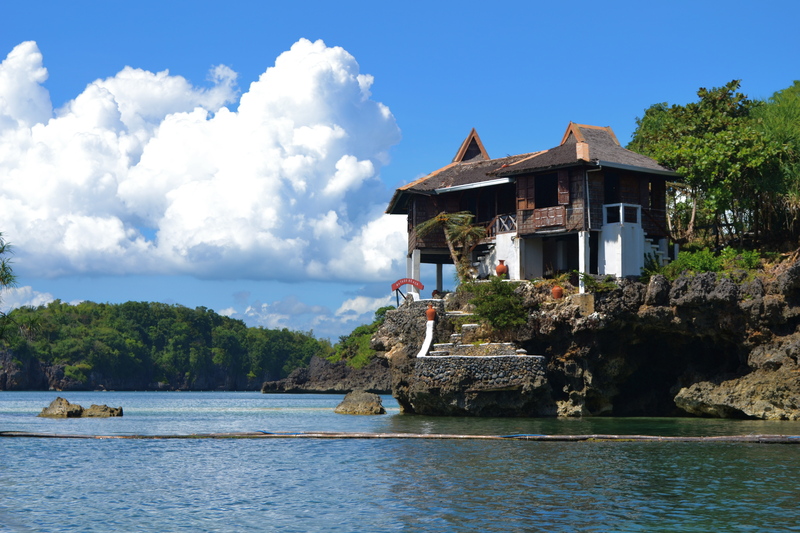 The first view that came into our sight was the preserved resort of a gay couple (Filipino & German) who are already both dead. 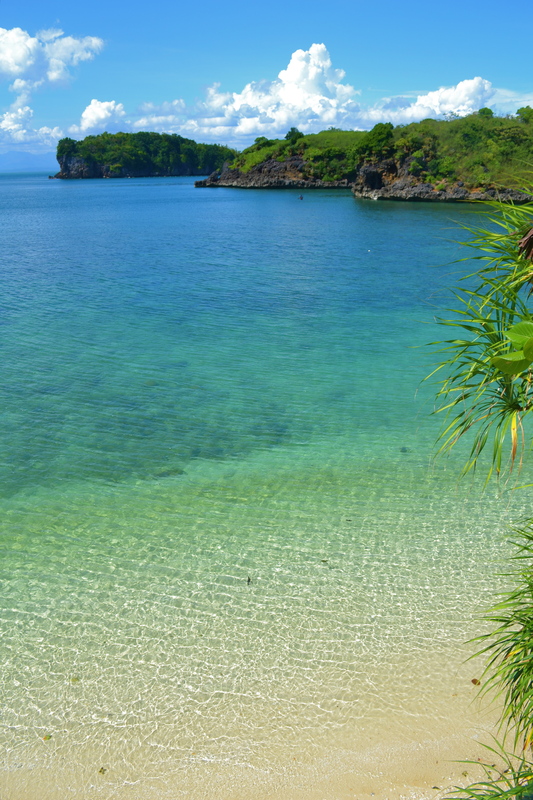 This was a private island before and now it has been opened for visitors to take a glimpse of the island. 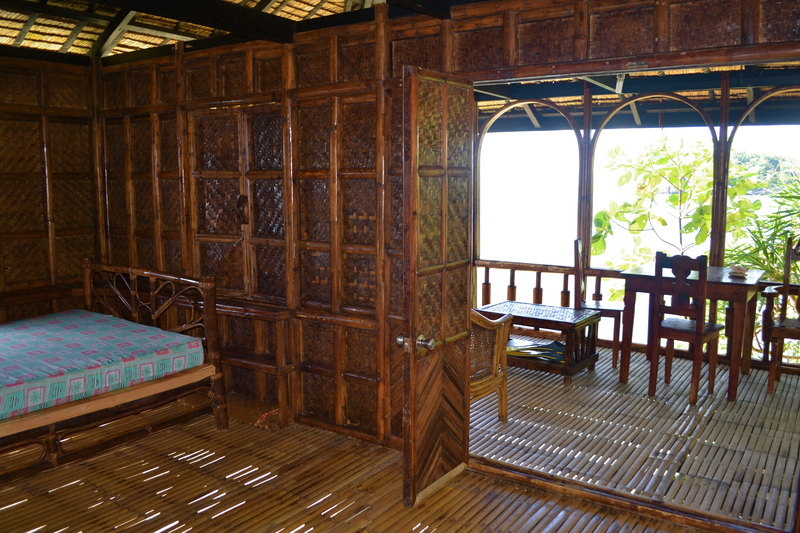 However, it is not open for overnight stays as we were told by the tour guide. 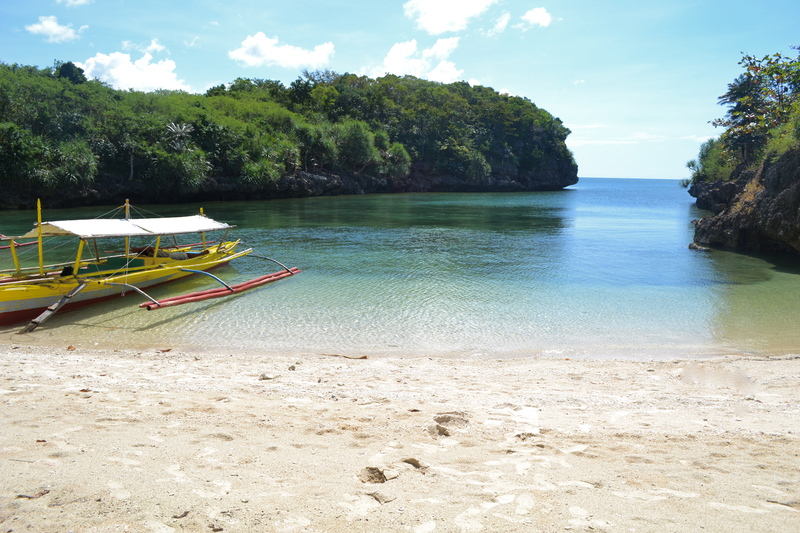 We entered a cove and docked at one of its beaches. Oh it was just pure serenity at the place. 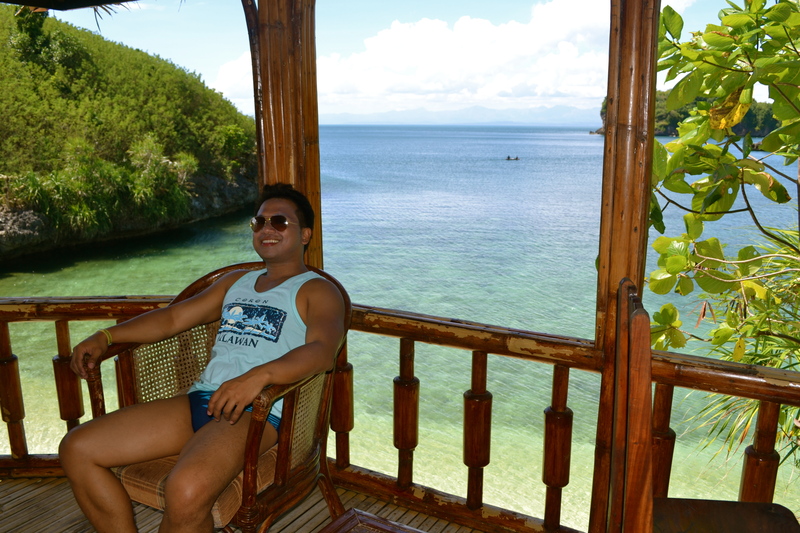 I wish I could stay here for days and just enjoy its unadulterated state. 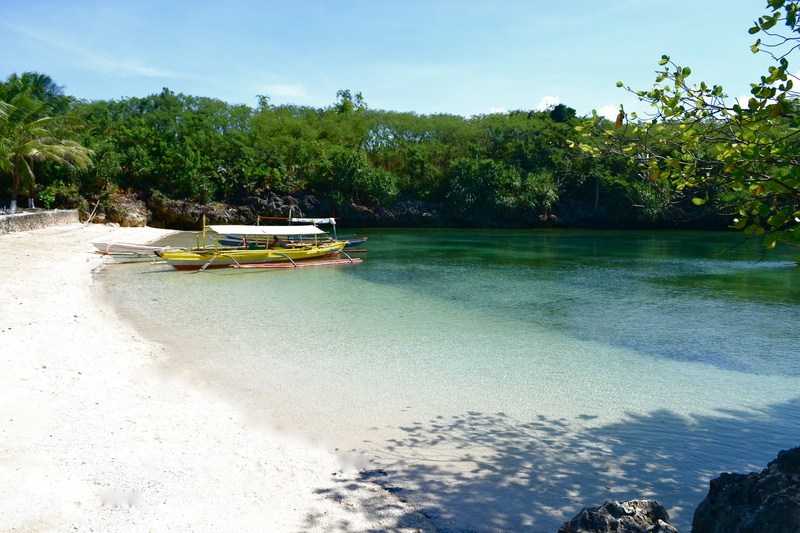 The clear waters was enticing but we did not feel like swimming at this beach. 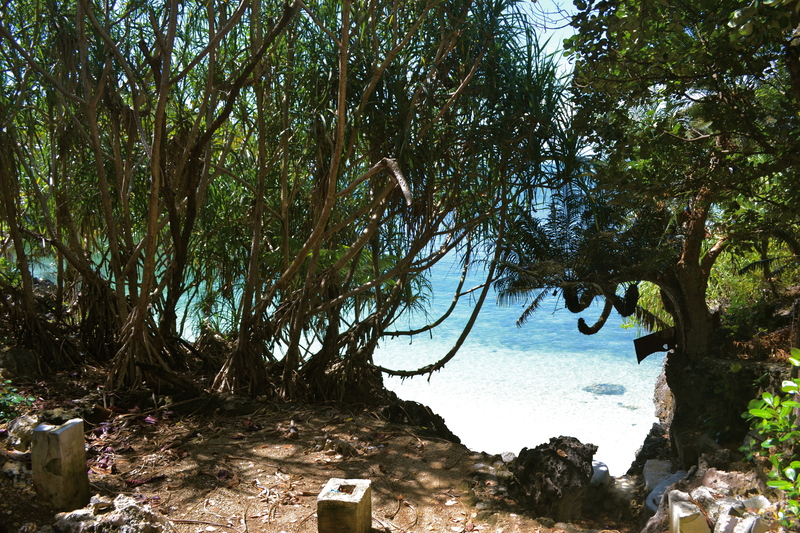 Neither at our left side where there was another secluded beach. 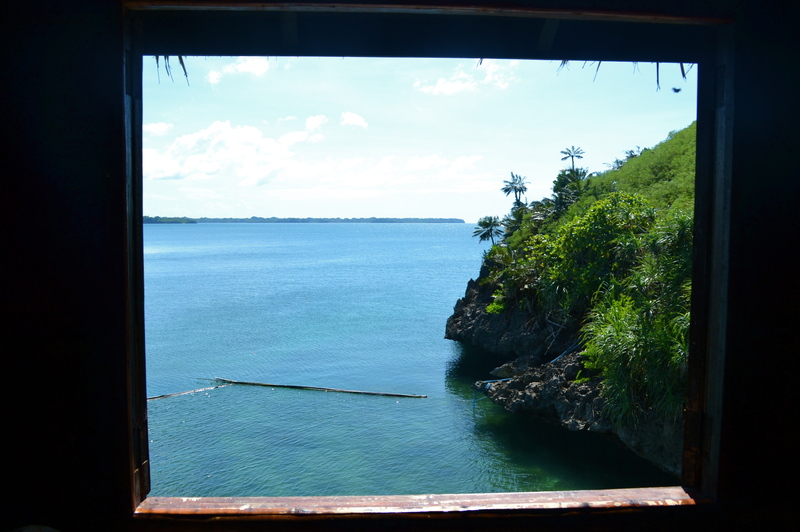 Instead, with the instructions of our tour guide, we climbed up the cliff and reached the preserved resort. 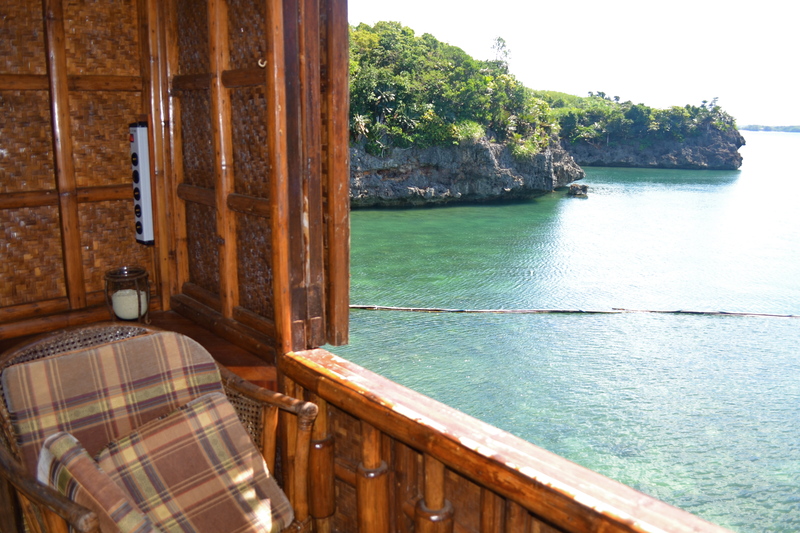 We stayed for a while at the balcony…. …having one of the surreal vistas I have ever experienced in a while. 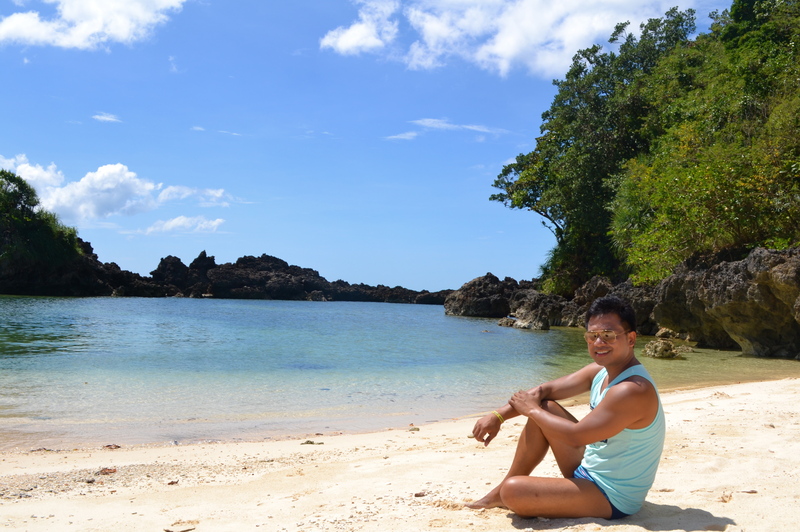 The stunning view of the islets and the clear, calm waters…. …just took my breath away. I had to sit down to relax a bit. 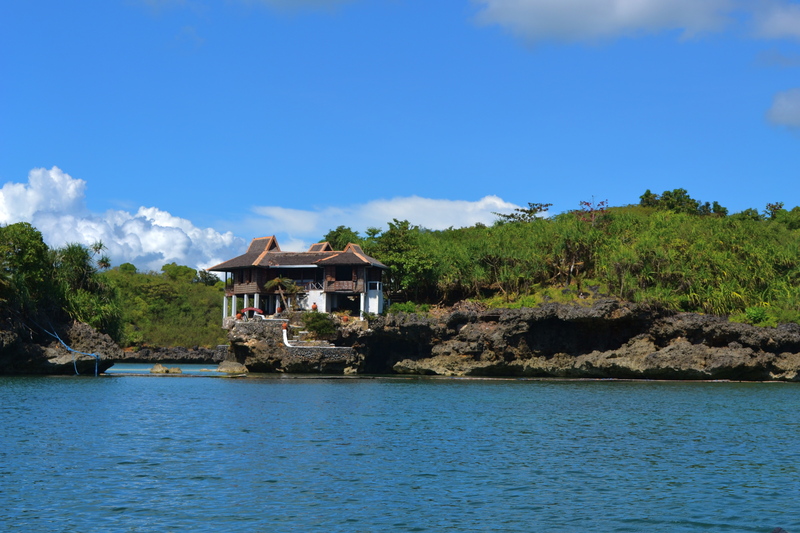 After the frenzy died down in my system, we took the short tour inside the cliff top rest house. 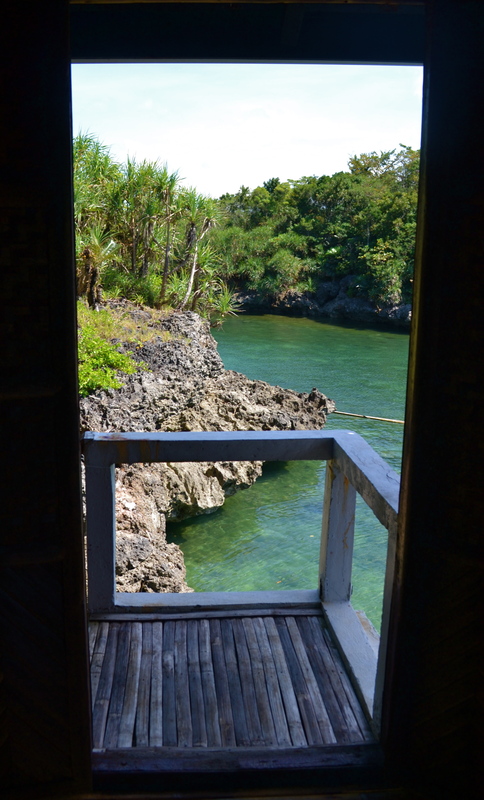 Whether it was the view at the doorway…. …or at the window, it was really overwhelming. This is a perfect place to relax. 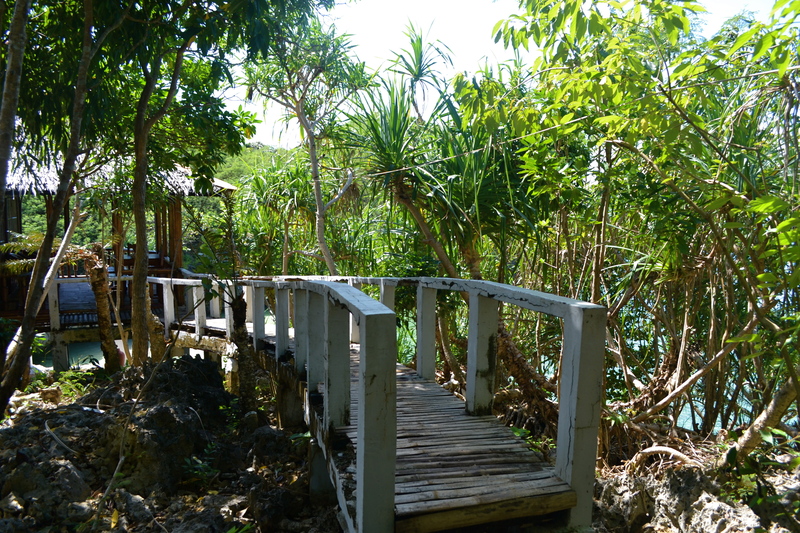 Afterwards, we took the other pathway leading to the beach below. 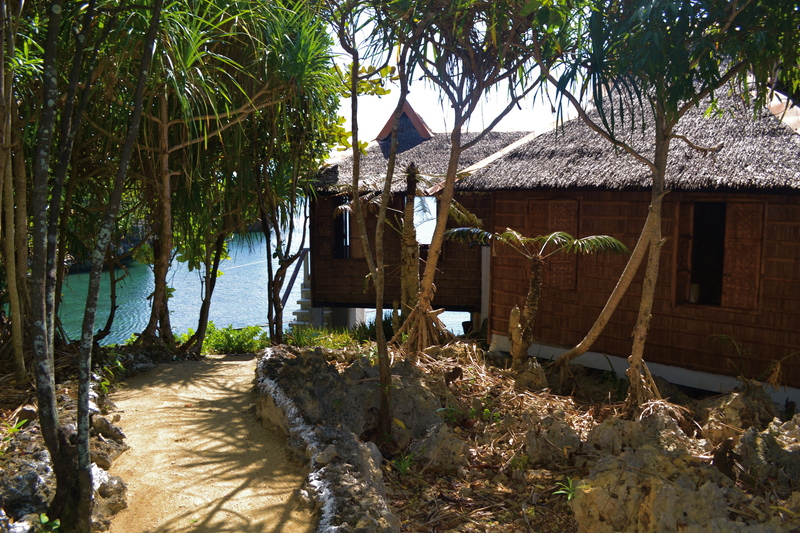 A few steps below was the clear waters that we could see from the rest house above. 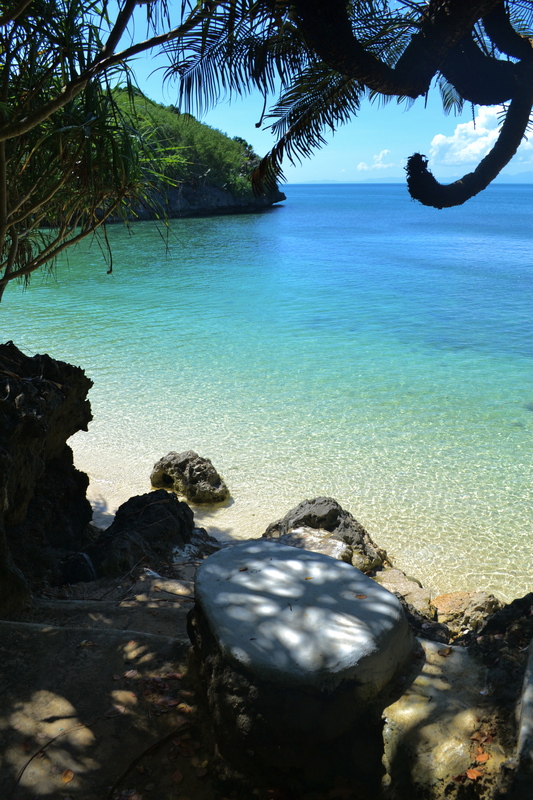 Another breathtaking perspective of the secluded beach! 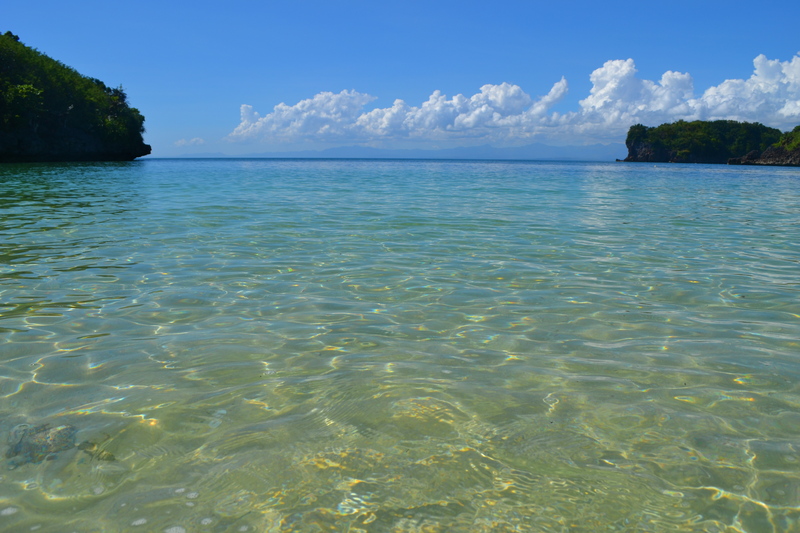 Whew, actually at this point in time I was really catching up with my breath not knowing whether to swim, sit down and just enjoy the view or continue taking photos of the amazing place! We went down to our private swimming area! 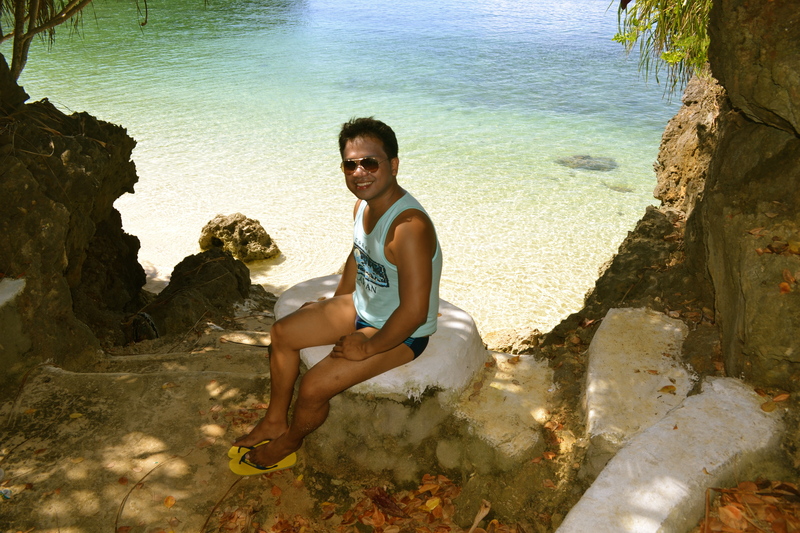 Yes, I stripped down to my swimming trunks! 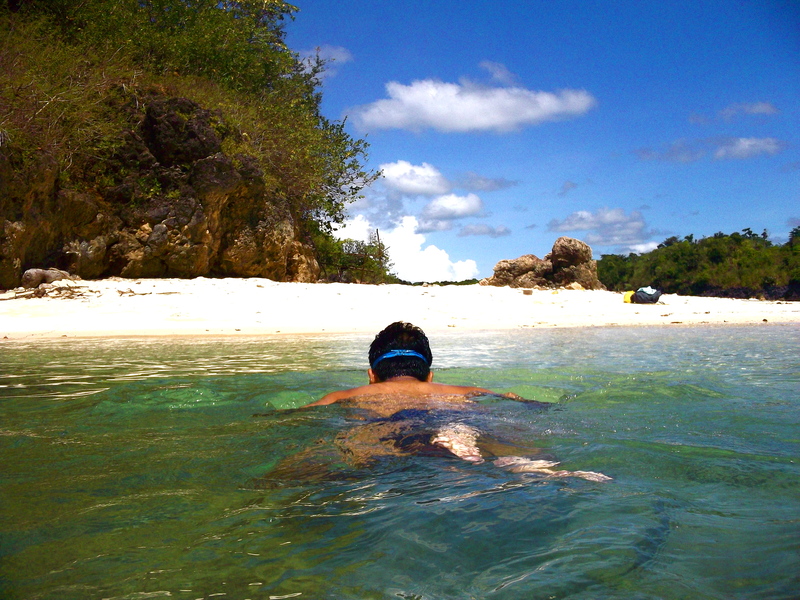 Immersing in the crystal clear waters. 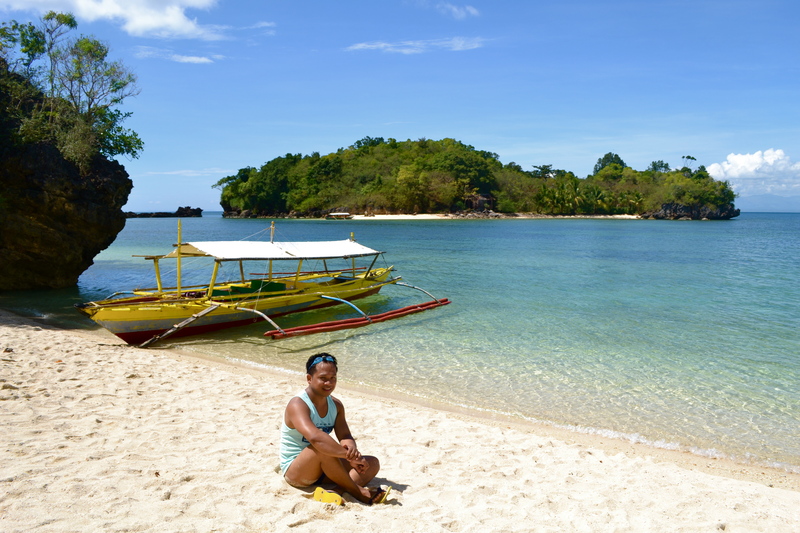 It was an experience and I was sorry I thought lowly of Guimaras before we embarked on the trip. 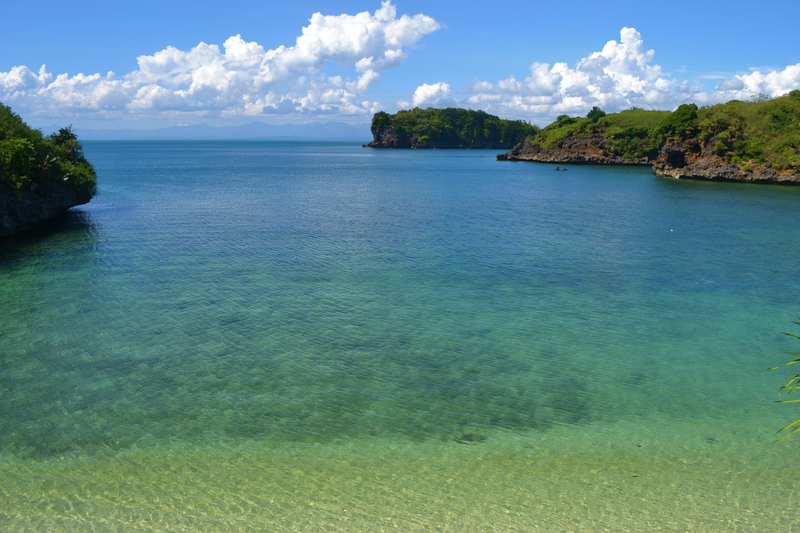 As we went back down to the main beach, we caught a top-view glimpse of the other beach. 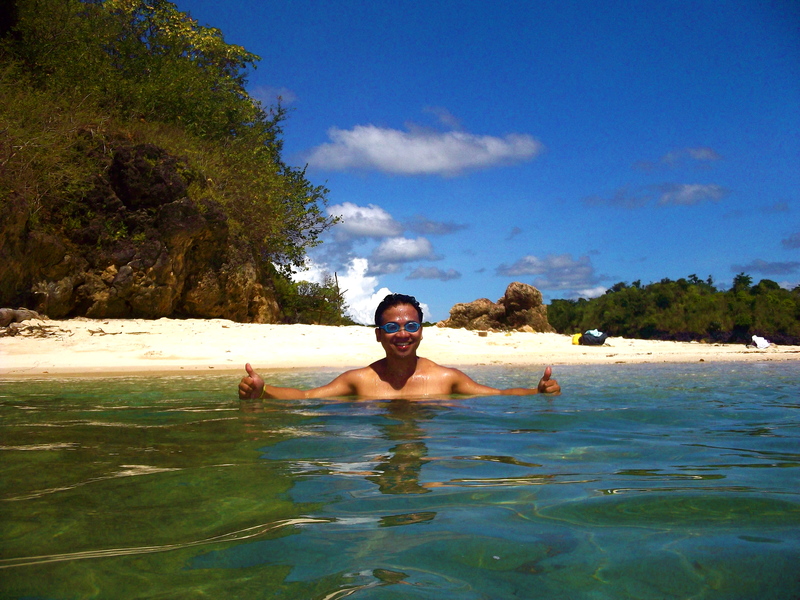 And it was time to go back to the main island of Guimaras. 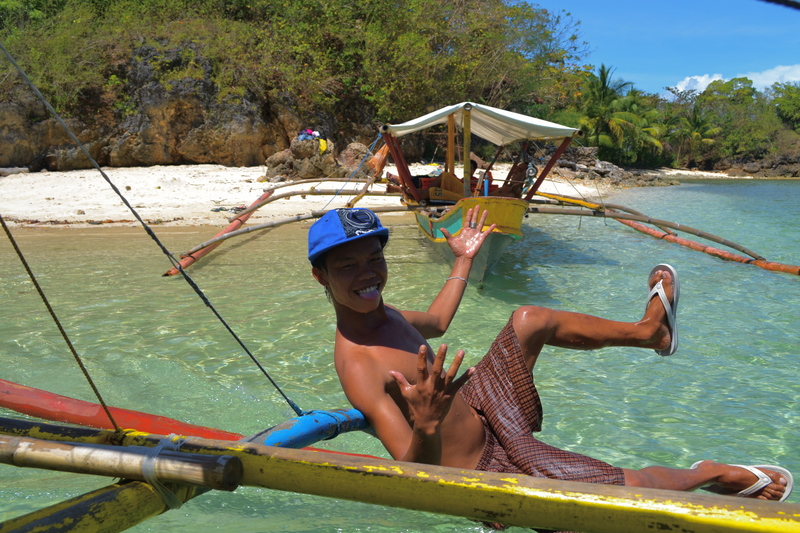 I was all smiles and so thankful to our tour guide, Jomar, and our boatman. 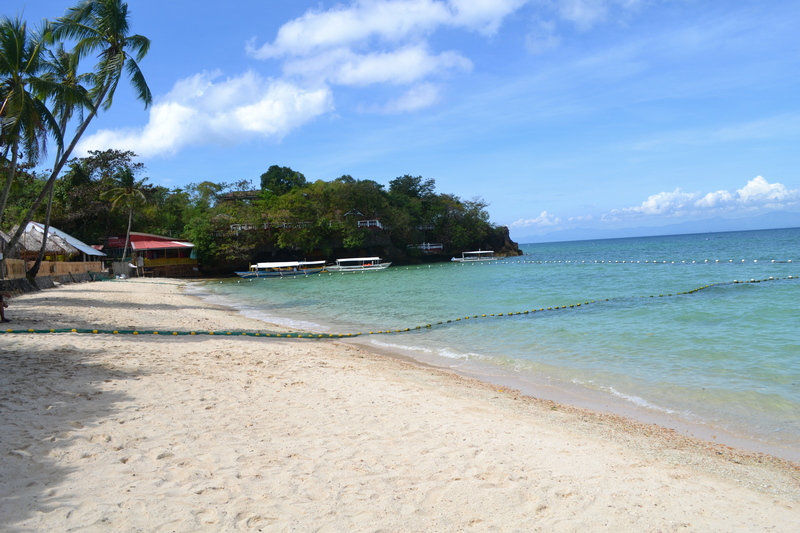 We reached Alubihod Beach after 20 minutes. 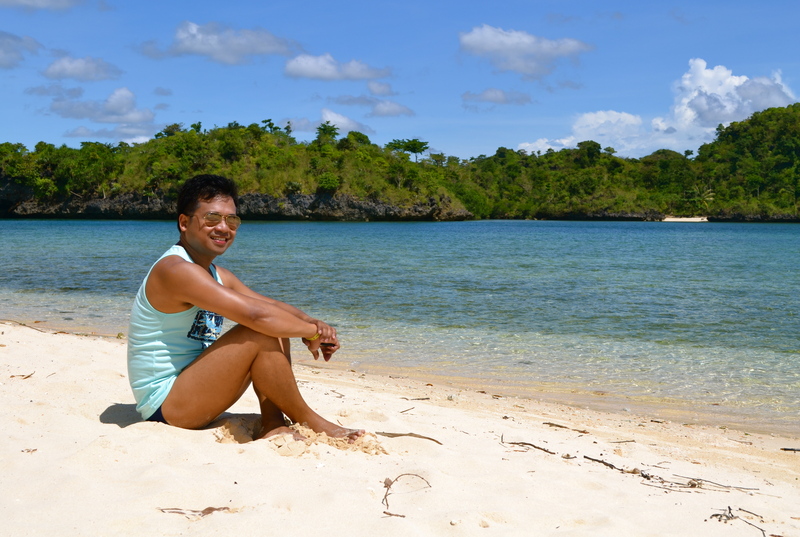 We could have chosen to spend more time on the beaches and islands that fascinated us but as originally planned we decided to go back to Guimaras main island. 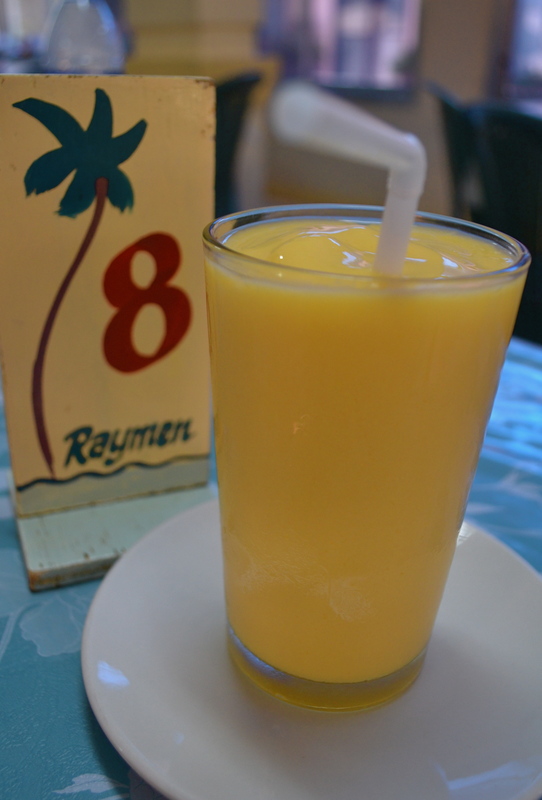 By mid-afternoon we were back in Guimaras slurping on sweet mango shake at Raymen Beach Resort after which we took the same tricycle to go back to Jordan port. All together with my good friend, Victoria, and our hired driver, Michael, we went back to Jordan port stopping by briefly at…..
….and at a stall selling mostly the world-renowned mangoes and its by products. 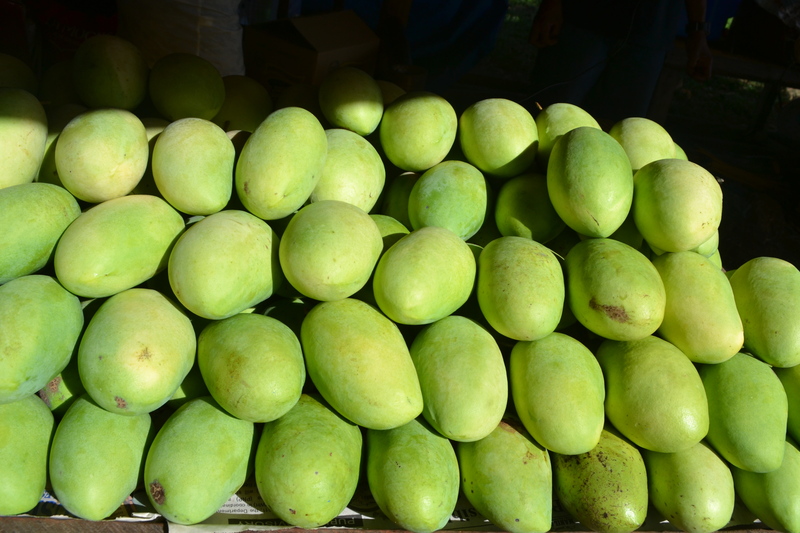 We bought 10 kilos of these green mangoes that would ripen a few days after. 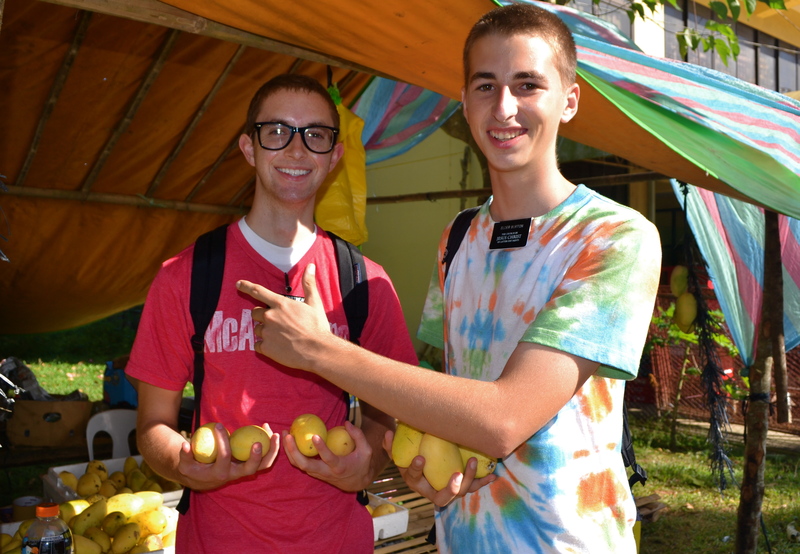 At the mango stall, we met the friendly Mormon elders who could speak 2 Philippine dialects plus the Philippine national language! 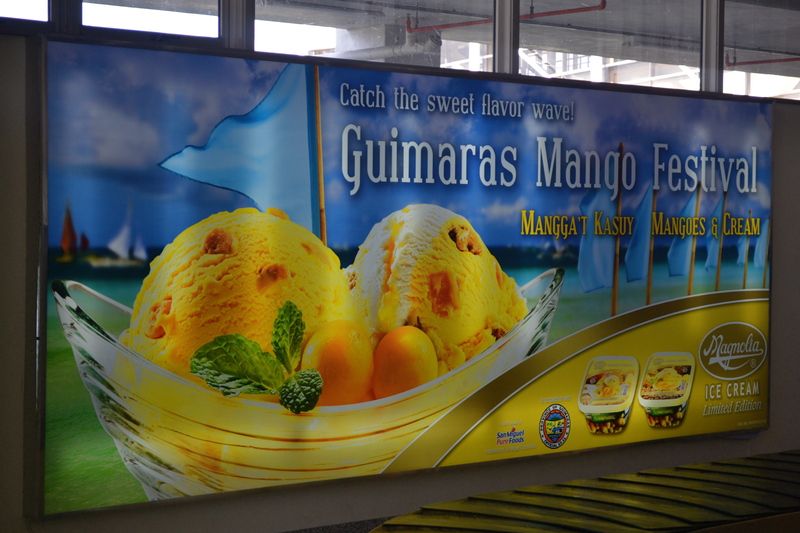 They’re currently based in Guimaras and just love the Guimaras mangoes! By late afternoon we were back in Iloilo City having the famous La Paz batchoy in Ted’s. 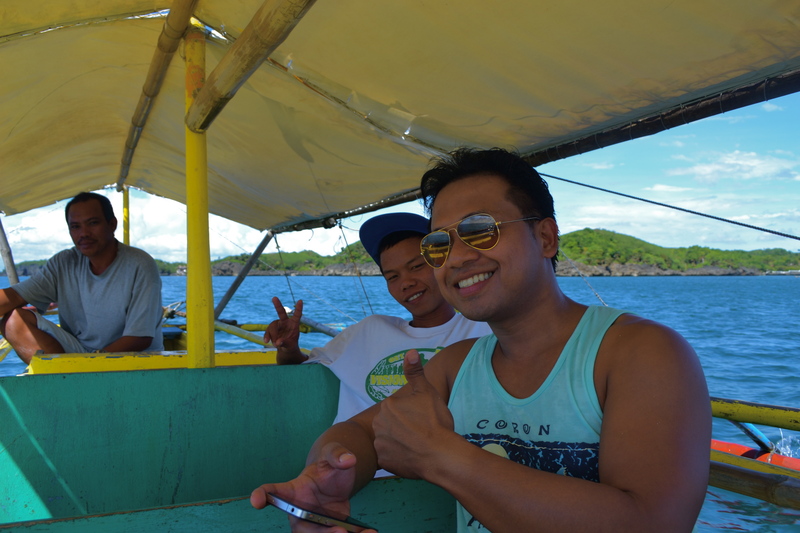 This is definitely one of the few island trips I had in my life wherein I was not expecting anything great on the sights especially the beaches. 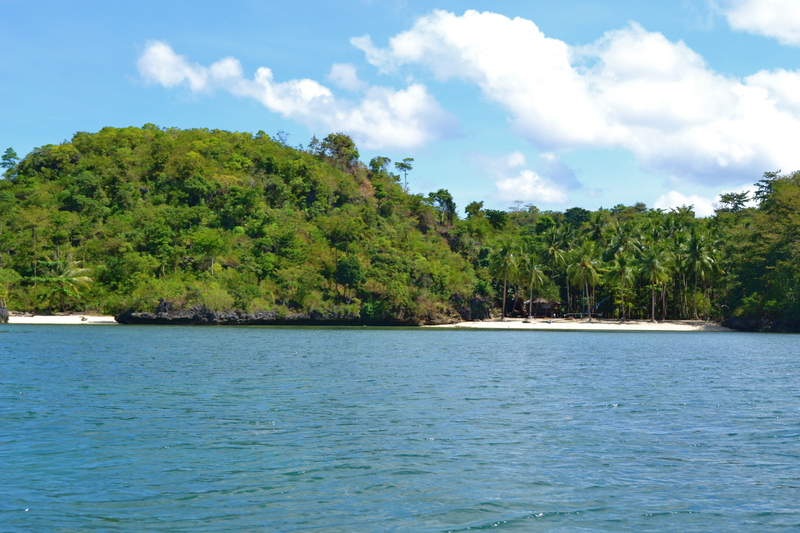 However, with my expectations very low, I was stunned at how beautiful the outlying islets were. 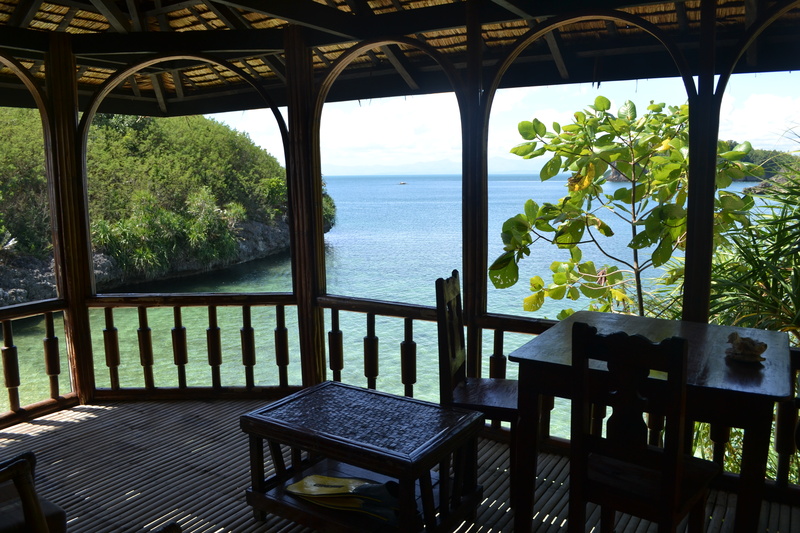 Someday I would love to spend a few days on those remote resorts in the islands just reading books, listening to music and writing my life experiences. 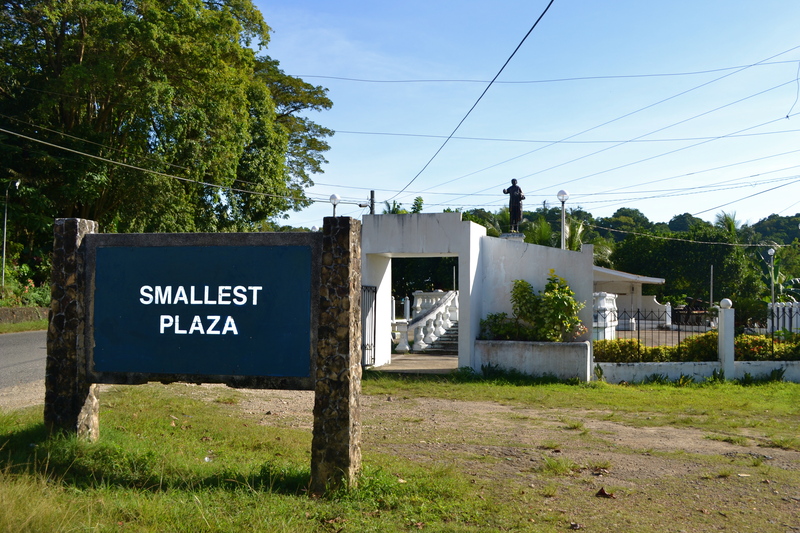 Very, very nice where you can rest and have a vacation, not so far from the busy city of Iloilo.